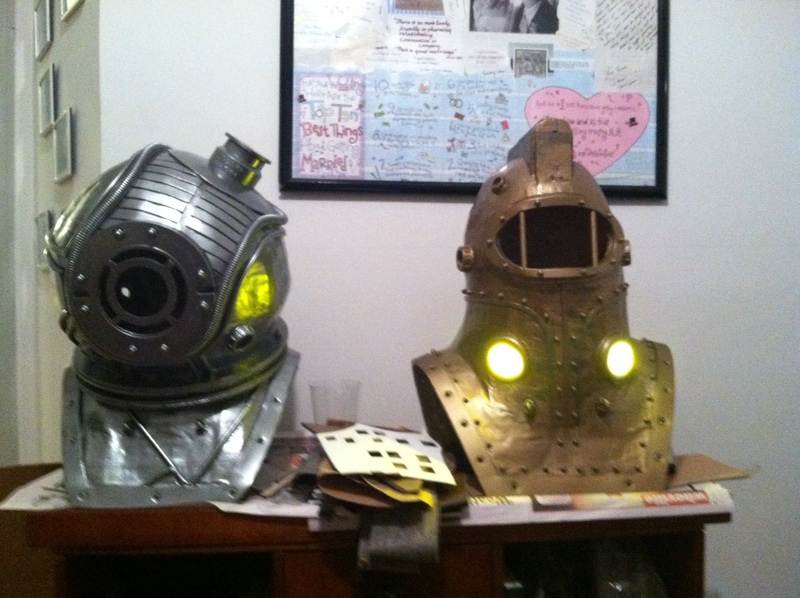 With the helmets finally built and painted and distressed, all we had to do was add the lights. 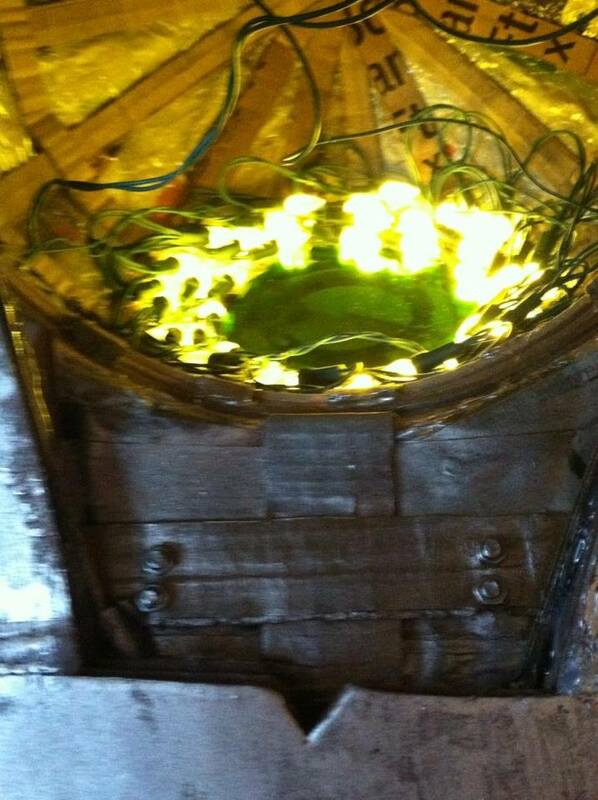 For some more experienced cosplayers this may not be a big thing but for us, the prospect of adding a lighting element to our project was incredibly stressful. We’d been planning and testing and researching for this critical step since the beginning of the process in June, it was currently March. Due to budgetary constraints and inexperience, much like the decision to ask for help with Eleanor Lamb’s suit, we decided to opt for battery operated Christmas lights rather than try to rig up our own lighting system. We landed on Christmas lights after days of off and on combing the internet and not liking the look of anything. We had to keep in mind that these lights would be mounted in our helmets and close to our faces so they needed to be small, bright and cool. When you don’t know what to look for, this can be a very daunting process. For now, as beginners, we played it safe. We bought a couple of packages of indoor mini Christmas lights that were battery operated and tucked them away until we were ready for them. Since both of us have a back ground in theater, we decided to use theater lighting gels to color the visors of our helmets. You can see from the reference pictures above that we wanted a yellowy glow for Subject Delta and a sickly green glow for Eleanor Lamb. 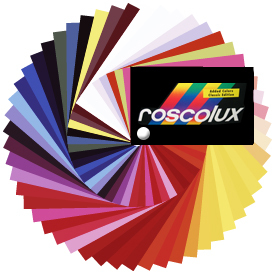 We used a Rosco gel sample booklet to concoct a mix of colors that would give us the desired color. For Subject Delta we decided on#12 Straw and #2003 Storaro VS Yellow and for Eleanor Lamb we decided on #4915 Lavender and #388 Gaslight Green in case you’d like to look them up. In the end, we ended up ditching the Lavender. I wanted it to help make the green murky but it wound up making it too dark. So we paired the Yellow with the green for Eleanor Lamb’s visor. We cut the porthole shapes out of the gels and then hot glued the edges together so they would be easier to glue into the helmets. 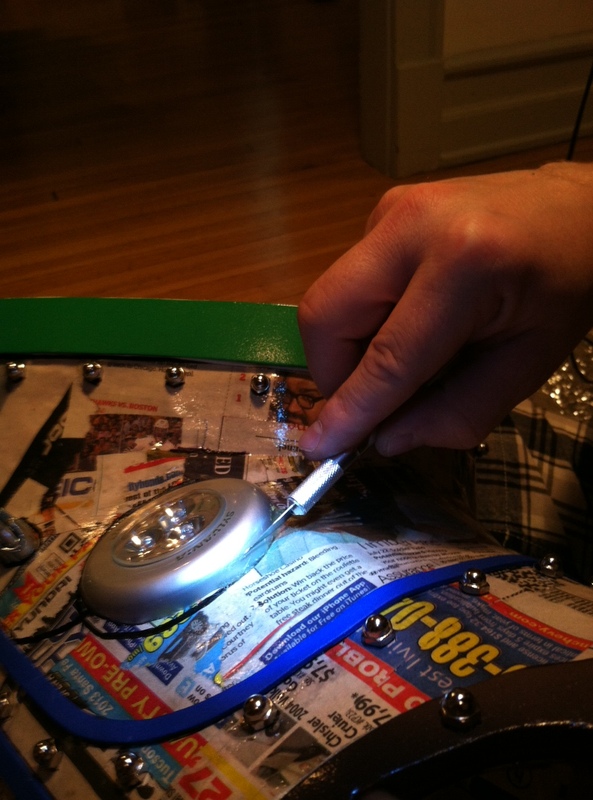 Next came the long, involved process of gluing a webbed pattern of Christmas lights into the helmets. We had to be careful as we worked, we wanted light to spill out of the portholes but the lights themselves needed to stay unseen. This was incredibly difficult but we managed and silently hoped that none of the bulbs would burn out since, you know, we’d glued them into place. 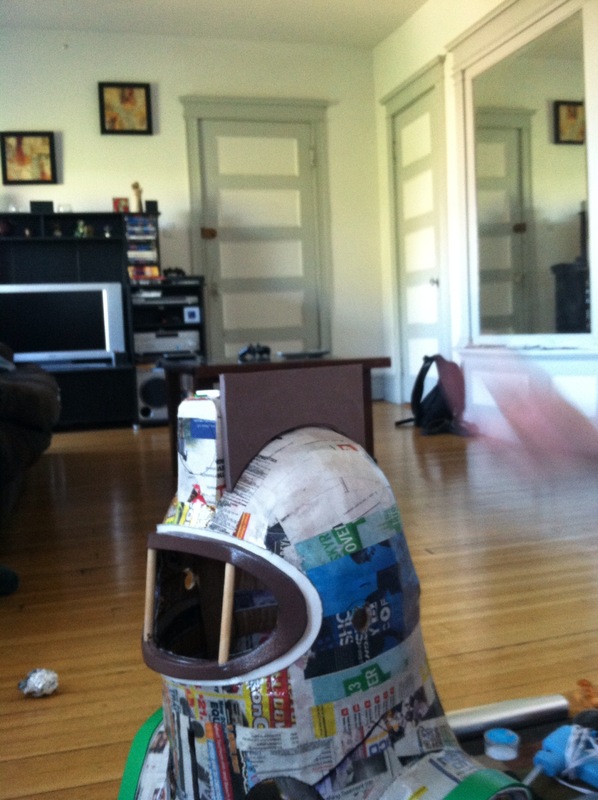 After several hours bent over with a glue gun into the small openings of our helmets, we finished. Hooray! Subject Delta’s face is never seen. Not just because he’s the playable character in a first person game but even in all of the concept art and fan art. 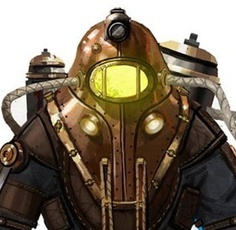 Turns out that most Big Daddies have a bio-chemical gel in their helmets that will react to their state of mind. That’s why you have different colors radiating from their portholes but never faces. From the photo above, you can clearly see Daniel’s face. So we bought a couple of Halloween invisible face masks so that we could still see but our faces would be obscured. Unfortunately, the black mask ate up the lights from the glued in bulbs so we ditched the idea for Eleanor and decided that it was more important that Subject Delta’s face be hidden than for the glow to be bright. And here’s our finished product!! Finally, finally, FINALLY – we got to paint!!! 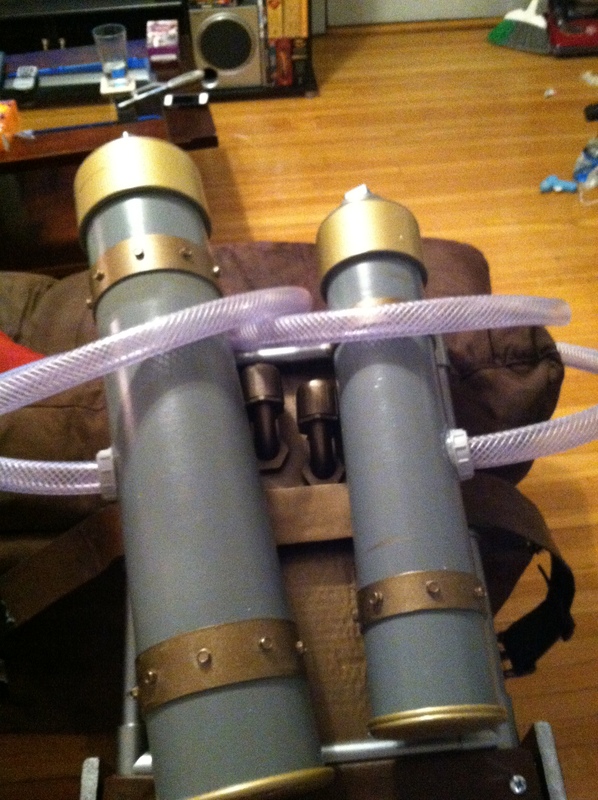 That meant we were so close to completing our first Cosplay project!!! Ideally, we would have liked to have built our pieces and then painted them as we went. However, we didn’t (and still don’t) have a dedicated work space which made that a little hard. Plus, we waited a little too long and, when the time came to paint a few pieces, the weather had turned. So in an attempt to wait it out, we kept building and planned to paint everything at once. With no more building to do, it was time to put some color on ‘em! 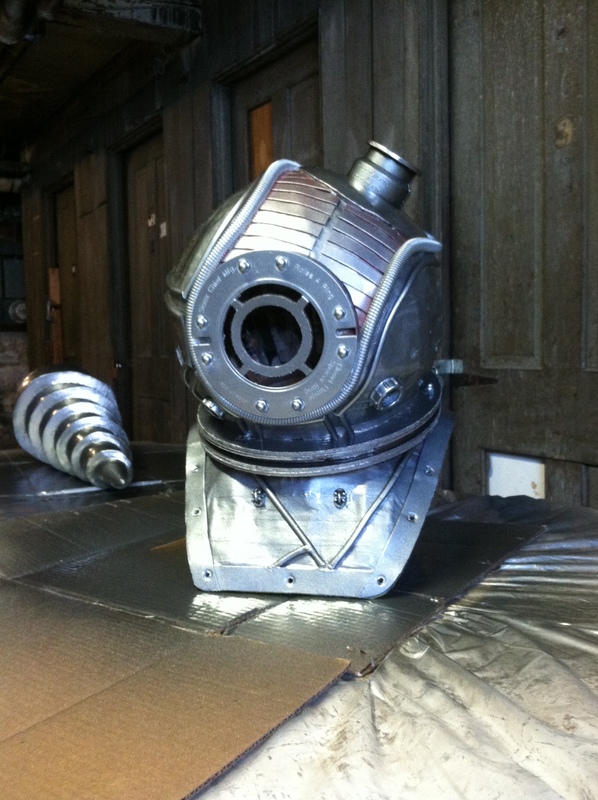 Time to transform them from foam and paper into convincing, hard metal objects. We had two options when it came to painting. We could hand paint everything in the relative comfort of our apartment or spray paint our pieces in one of the common areas of our apartment building. Hand painting would have let us paint whenever we liked as long as we laid something down to catch the paint and opened the windows with fans for ventilation. However, we thought it would have taken a long time to paint everything; especially if we wanted nice, smooth, streak-free finishes. I figured spray painting would eliminate that concern. Plus, I’d had more experience with a spray can. So, we chose to do the majority of work with spray paint but for some detail work, touch-ups and distressing done by hand. Now, the first problem with spray painting in Chicago is that it’s illegal to sell spray paint within the city limits. We’d only been living in the city for three years at this point and who would have guessed that this was an actual law!? 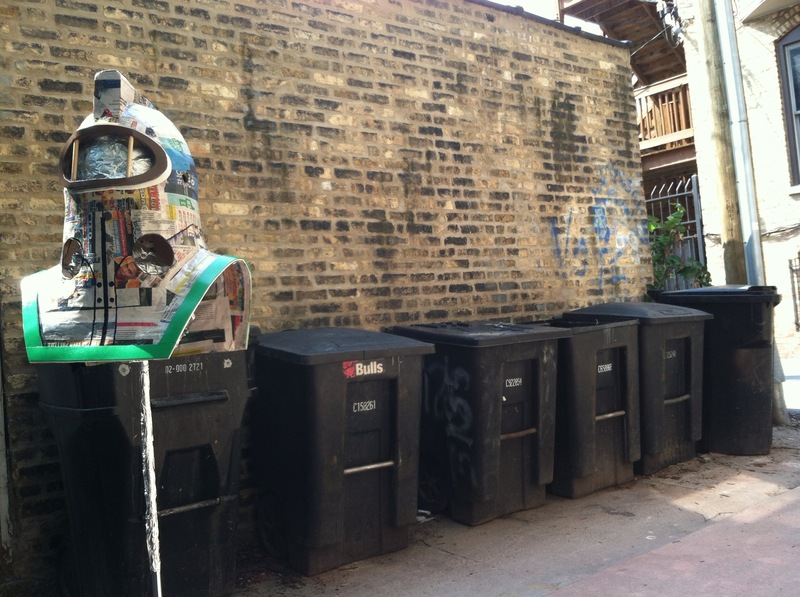 It exists to combat graffiti and tagging within the city; but, if you’ve ever spent a day in Chicago… lots and lots of graffiti… So the only thing this stupid law really does, it make it very difficult and annoying to procure spray paint. 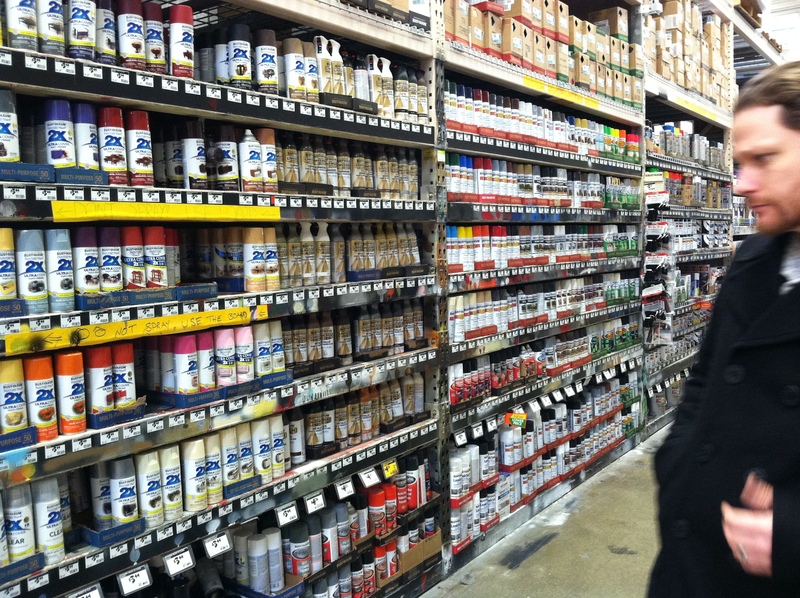 The nearest place for us to get some was at a Home Depot on the border of Chicago inside Evanston’s city limits. That’s a 45 minute train ride, plus a 25 minute bus ride… Through out the course of the this project I had to make three separate trips to the suburbs for paint. Oh well. On our first trip, we made the trek and the paints we decided to use were: Antique Brass for the base tone of the brass pieces, an Antique gold for the highlights on the brass pieces, Dark Steel for the steel pieces, and a Leather Brown for painting some of the rubber pieces to appear leather. “What about the primer,” you ask? Well, as much as I would have liked to have given everything a nice primer base coat we were very limited on time and I didn’t want to have to do any more spraying of harsh chemicals then need be in an apartment complex. So, we decided to skip it. Paint in hand, it was time to… well, paint. Wouldn’t you know it? This was one of the harshest winters in recent US history and Chicago was hit pretty hard. Ever heard of a Polar Vortex? Here we were, well into March, and the temperatures were still right at or just below freezing. With C2E2 just around the corner we had to paint or we risked not having the costumes ready in time. 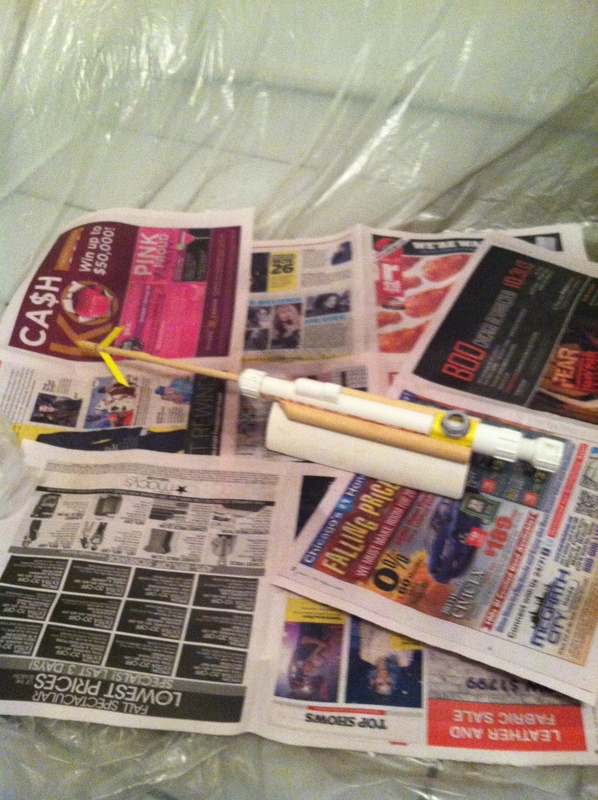 So we decided to do the worst thing imaginable… spray paint indoors. I know, I know… don’t get me started. We all know how this ends. 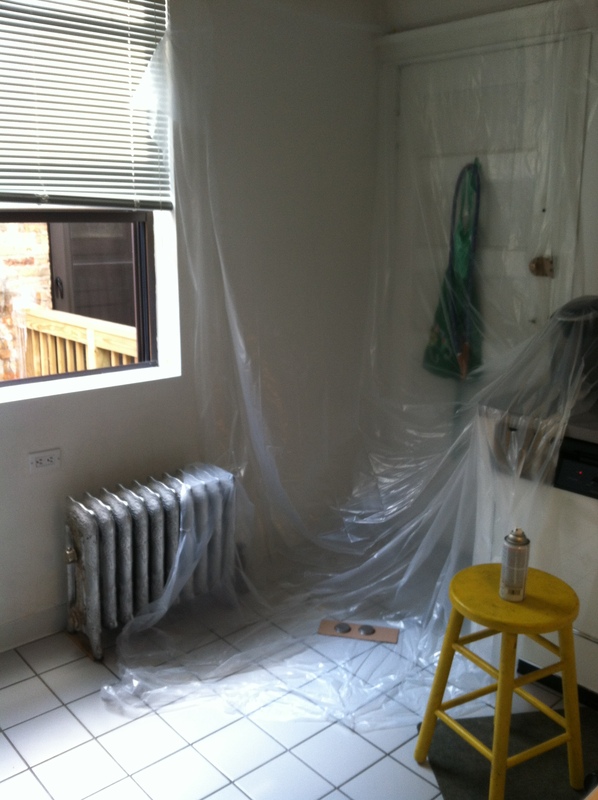 We decided to set up a small, make-shift painting room in the kitchen. We laid painting tarps on the floor, hung some from the walls, opened the kitchen window, and used a floor fan for ventilation. Surely, this would be sufficient. A couple of hours of cleaning later and only a small percentage of Cosplay pieces painted – it was back to the drawing board. C2E2 was creeping up faster and faster and still we had constant snow fall and below freezing temperatures, painting outside was still out of the question. We were so desperate that it forced us to be creative. So, after a late night of — social hydration — I decided to use our common laundry room as a new paint studio and to knock out all of the spray painting in a few marathon sessions. It was the only indoor common area that was anywhere near warm enough and had proper ventilation. I didn’t want to piss off the neighbors or get the land lord called so I waited until 2 or 3 am before beginning. I crept as quietly as possible down three flights of stairs to the basement where the laundry room is located. I laid out my painting tarps over a couple of tables and lined up as many pieces as I could that were going to be painted the same base color. I did this every other night or so for a couple of weeks until all pieces were painted with their base coats. I even spent time after each painting session wiping down any surfaces that might have collected residue; including but not limited to the washing machines and bikes stored there. Seeing everything in living color was really really cool. No really. Really cool. It was amazing to see everything in it’s intended color. They looked real for the first time and I could tell that we’d really done good work. Really. I had a day off work when I did all the big major pieces and I sent Sara so many texts with pictures because it was so exciting. Subject Delta and Eleanor Lamb were really coming together. We did all of our touch ups with acrylic paint. It wasn’t an exact match, which was frustrating. Luckily, we were going to distress everything so that would help. Plus, the differences in color can give the impression that something has gotten dinged in battle and been patched up. Even though it all worked out, next time we’re going to try to avoid the spray paint. There were a couple of pieces that we painted by hand that turned out looking really good, which also served to sway me toward hand painting in the future. Included in this category was the trim of both Subject Delta and Eleanor Lamb’s helmets, the tanks for Subject Delta’s pack and Eleanor Lamb’s arm guards. 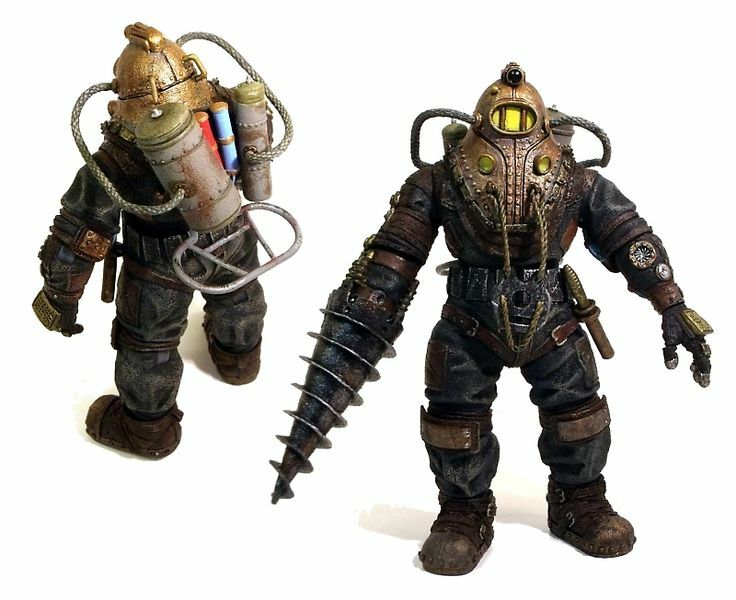 And for weathering, we used black acrylic paint and the process outlined in our Weathered Metal Effect tutorial which you can find here. Despite some major stress, sleepless nights and a whole lotta time in transit, we got everything painted and it looked amazing. We were so close to finishing that we could taste it! C2E2 was under a month away at this point, so we were beyond happy to have gotten to this point. It’s all in the details and boy do we have an eye for them; back-breaking, eye twitching detail. Daniel ran by Home Depot the next day, after our 6 hour rivet-fest, and picked up another set of cap nuts and we got back to work. This time we took a standing break with every section of rivets we finished and soon they were all in place and looking awesome! It was amazing what a little hardware will do to bulk something up! Now on to the final details and then we could put on a final layer of Shellac and we’d be all set to paint! First up: the weight hooks. If you’ll look at the reference photo, you’ll see that big grey ring near his belt. That’s no belt buckle; that’s a weight and it needs to be anchored to the helmet. I wasn’t sure what we were going to use for this but luckily Daniel is one sharp cookie. 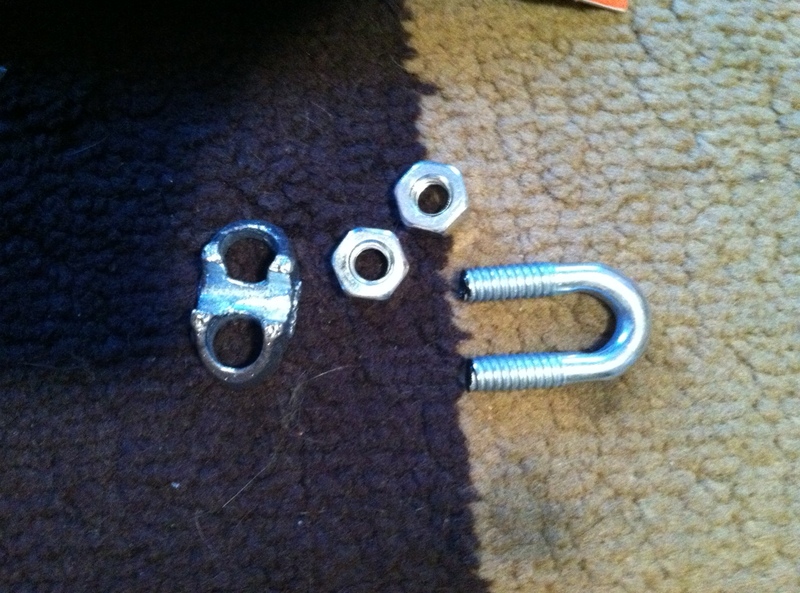 We needed a galvanized wire rope clip. 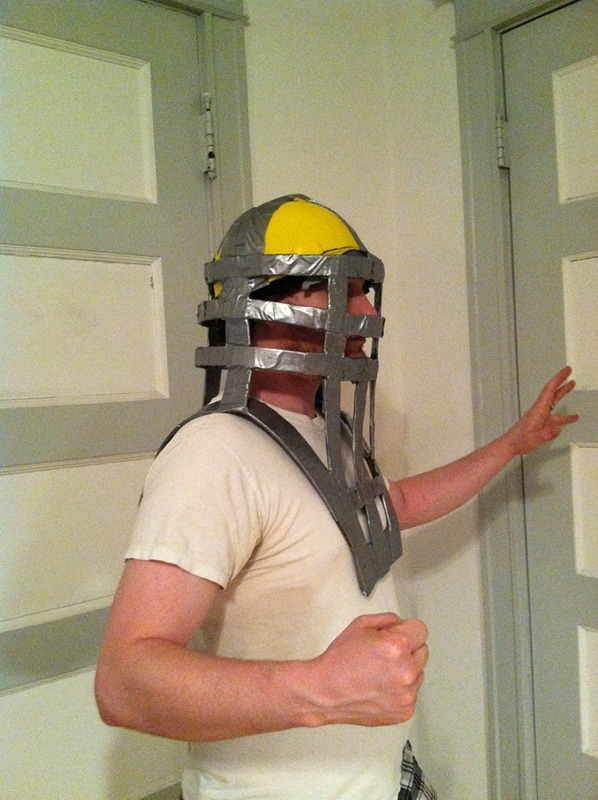 We traced the shape of the rope clip onto the helmet and then guesstimated the placement of the screws. Daniel drilled the holes and we were set to go! Looking hefty, right? Next: the handles on the back of the helmet. Here’s another reference photo for you to take a gander at the back of Subject Delta’s helmet. We took this particular detail as an opportunity to draw the eye lower on our the helmet; to detract from how tall and cylindrical it was. Rather than staying true to the reference, we opted to place the handles a touch lower on the helmet. 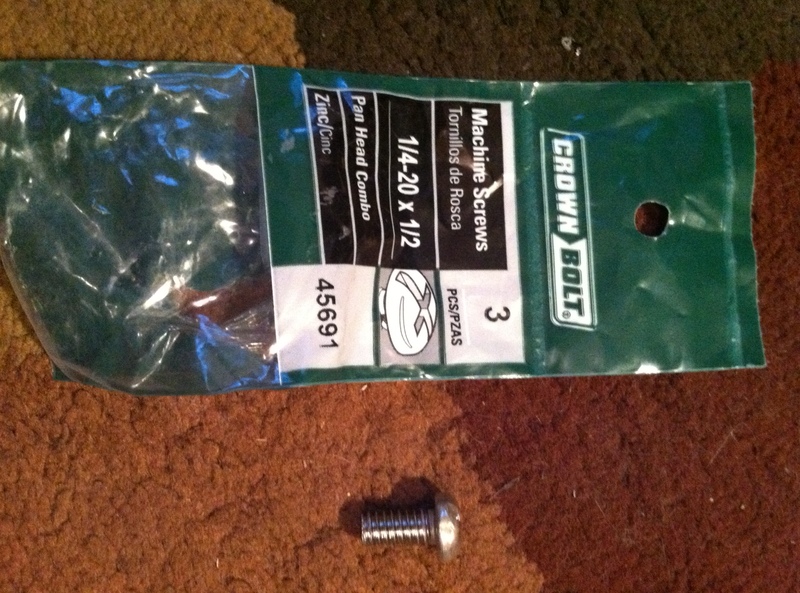 We bought a couple of basic cabinet handles but the screws were a touch too big. 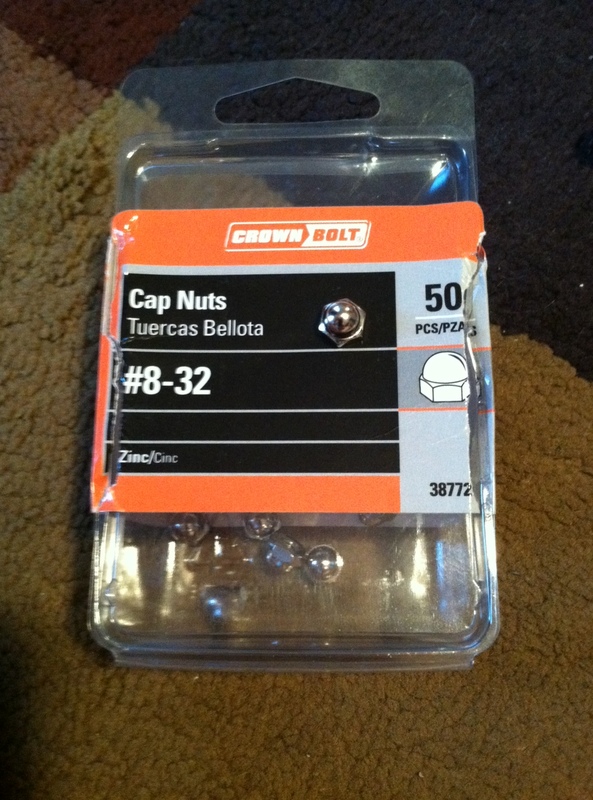 Daniel had to purchase some shorter screws to compensate. Just look at that difference! 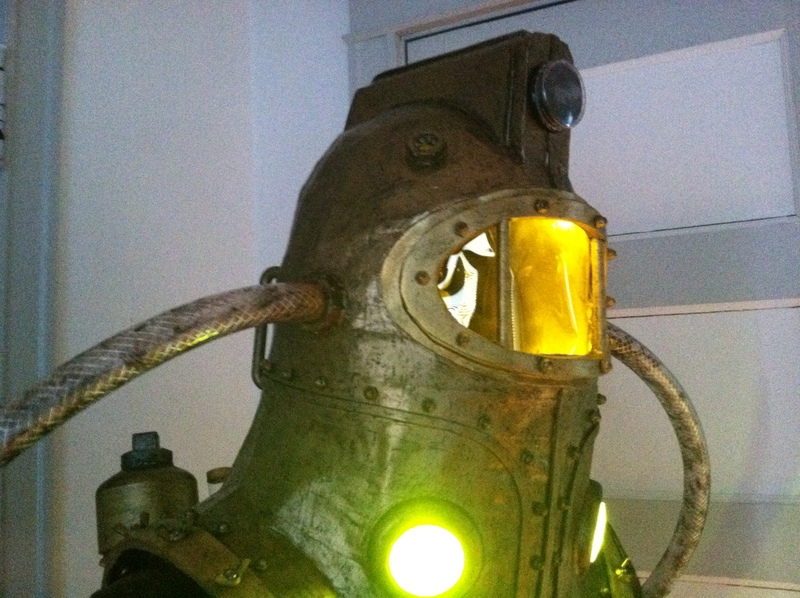 Subject Delta’s helmet lights; Sara and I have discussed them at length. If you’ll notice, they don’t just stick straight out of the helmet, they come off the helmet at a downward-slanting-angle. 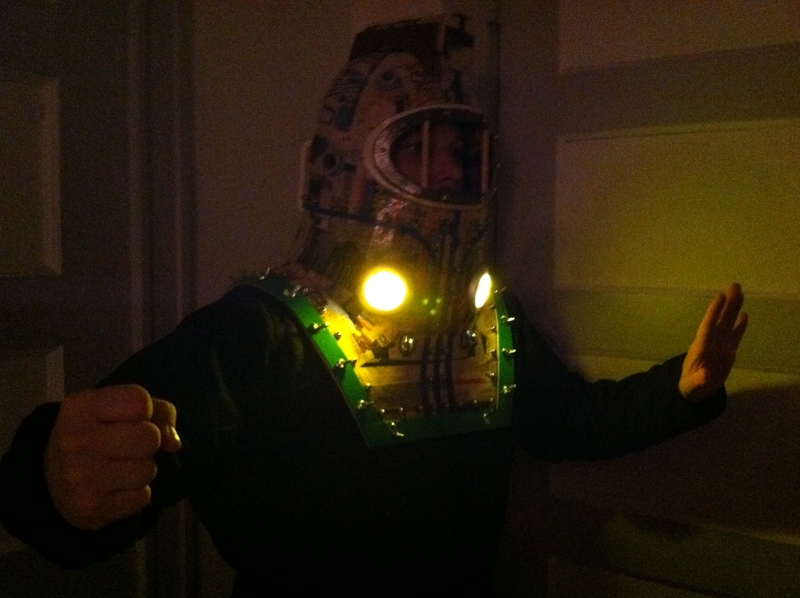 Sara was convinced that we would have to somehow build a tube or extension on the helmet in which to set the lights. My concern with this was that it would prevent access the battery pane on the back of the light. We want to be able to change out the batteries, you know? 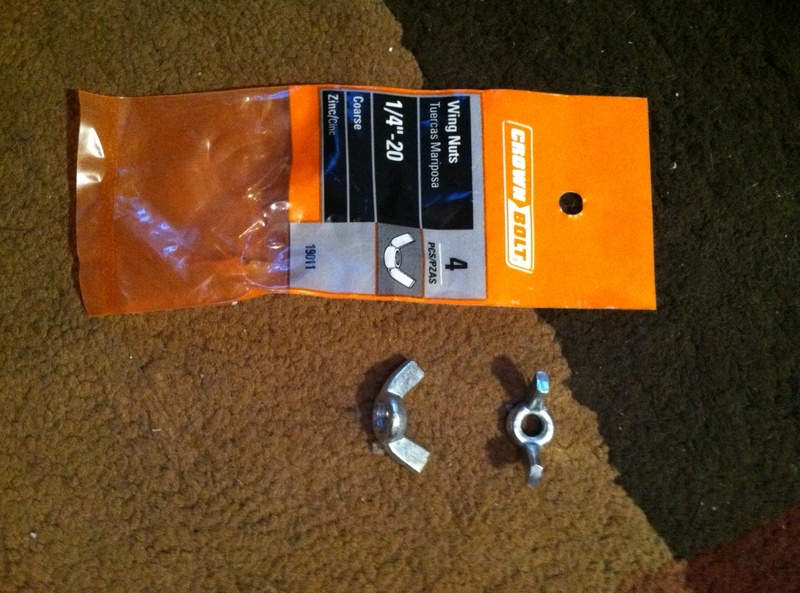 The last step: the wing nuts. Daniel insisted that we actually screw them through the foam along the harness. 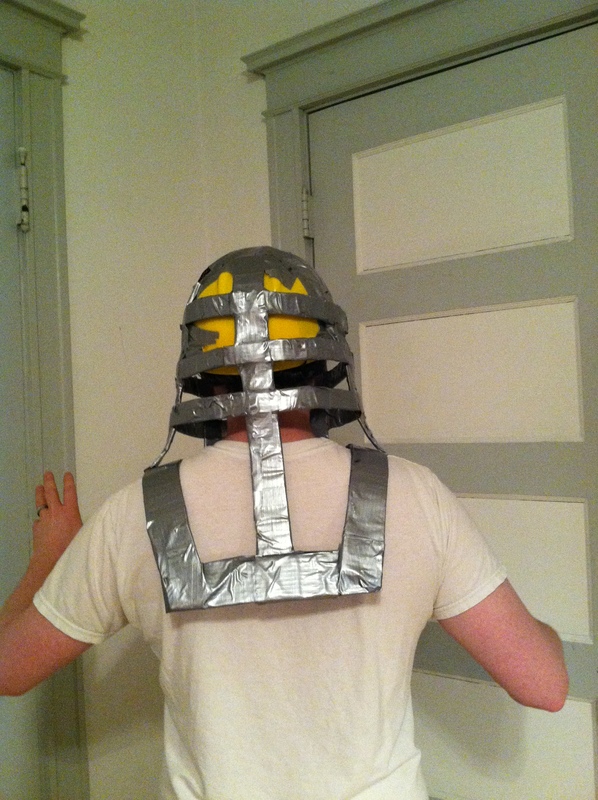 We took the wing nuts and spaced them appropriately along the harness of Subject Delta’s helmet. Luckily the rivets made our spacing a piece of cake. Daniel chose screws with a rounded head so that they wouldn’t dig into his shoulders as he’s trouncing around in costume. We marked the center of each wingnut and then Daniel went back and drilled through the layers of foam. Then it was just a matter of fixing them in place with the screws and we were set to Shellac. We had already sprayed a layer of Shellac before we applied the detail foam and cap nuts but now it was time to really set everything. We sealed the foam with Elmer’s glue and then took our helmet out into the dingy back alley of our apartment building where no one would be bothered by the fumes. Daniel concocted some caps to put over the push lights so they wouldn’t get gummed up by the Shellac. He’s so innovative! And then, with everything assembled and everything Shellacked it was time to take some pictures! And now, we will leave you with an action shot, complete with mood lighting! 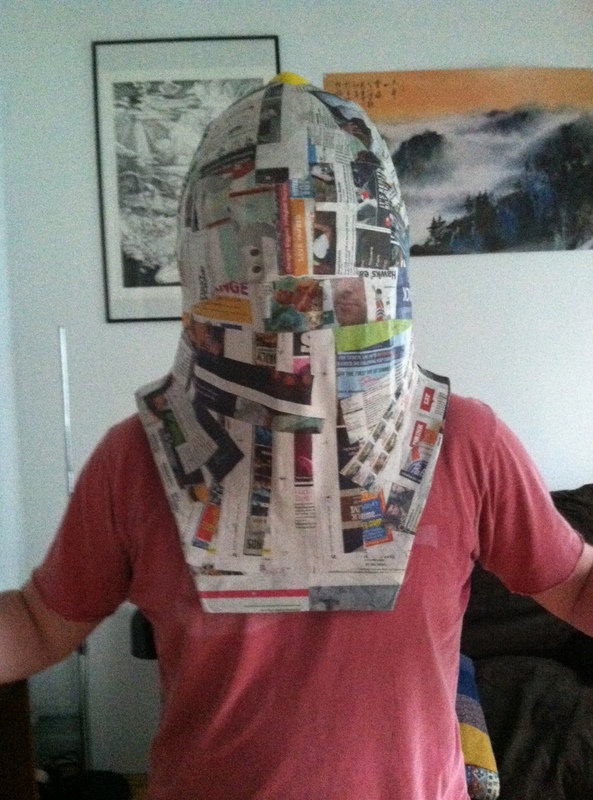 The major construction on Subject Delta’s helmet has been completed and, I don’t know about you, but I could use a break from this particular piece of cosplay. Check in next week to see where we end up working next! We’re down to the nitty-gritties! So they say. Last week’s epic progress had me motivated and I was determined to steam-roll our work this weekend. 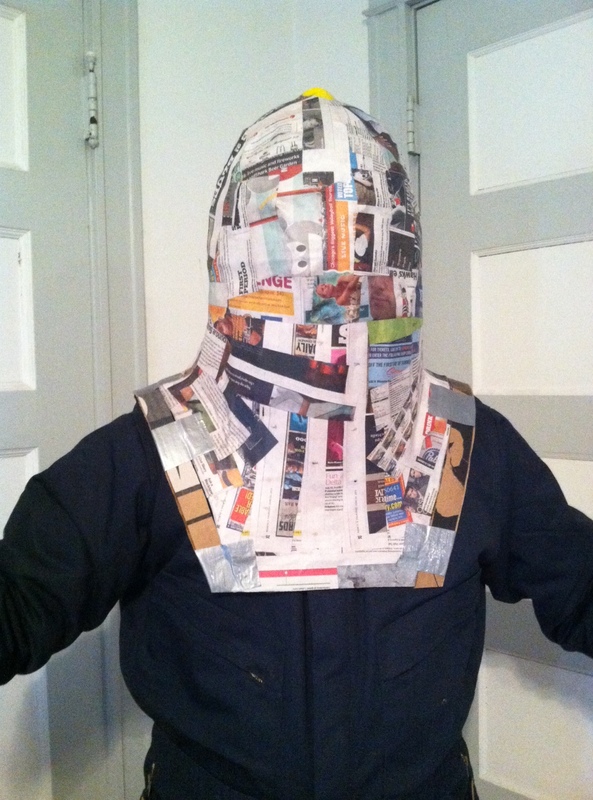 As we set up to work on Saturday I said to Daniel, “I want to have Subject Delta finished up to the point of painting and I want to have Eleanor’s helmet and harness built by Sunday.” And at one point during the work session Daniel said, “I like your drive today Mrs. Gilbert.” I was ready for some major progress. Can you remember a time when you made a list of things to do and severely underestimated how long it would take you to do something? I know I sure can, because that’s exactly what happened this week. 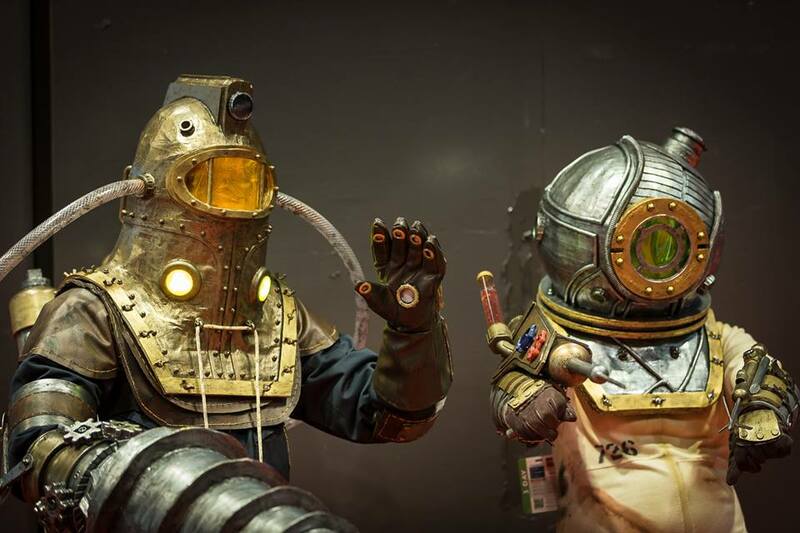 I’ve heard lots of people over the past few weeks talking about the painstaking work cosplay is, how the details can be truly time-consuming and it wasn’t until we set to work on the foam details and the rivets that I fully understood what they meant. We started with the details on Subject Delta’s camera unit. 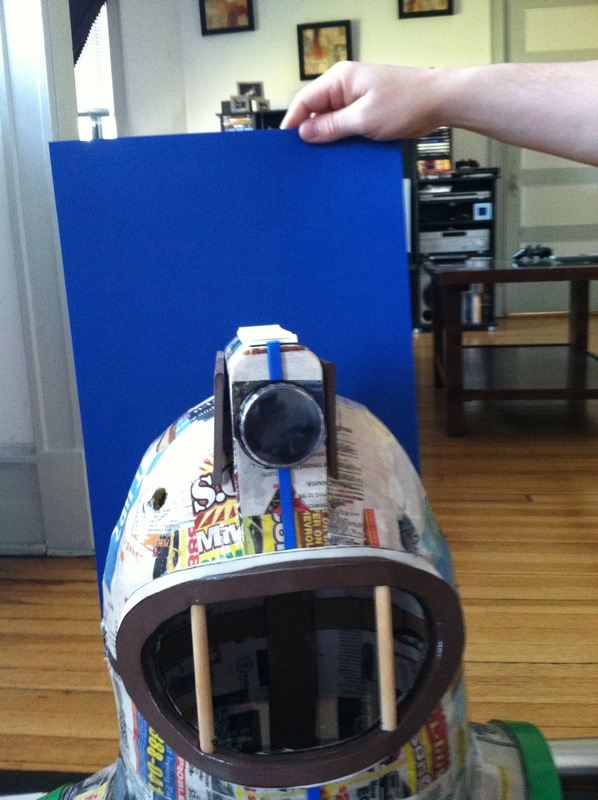 The shape of the helmet as it blends into the camera is just plain awkward and it took us a little while to figure out how to get a template. Here comes some of that Gilbert ingenuity I hope you’ve come to expect. Daniel grabbed some tin foil and rolled into a wire-thin piece which he then bent along the curve of the helmet. 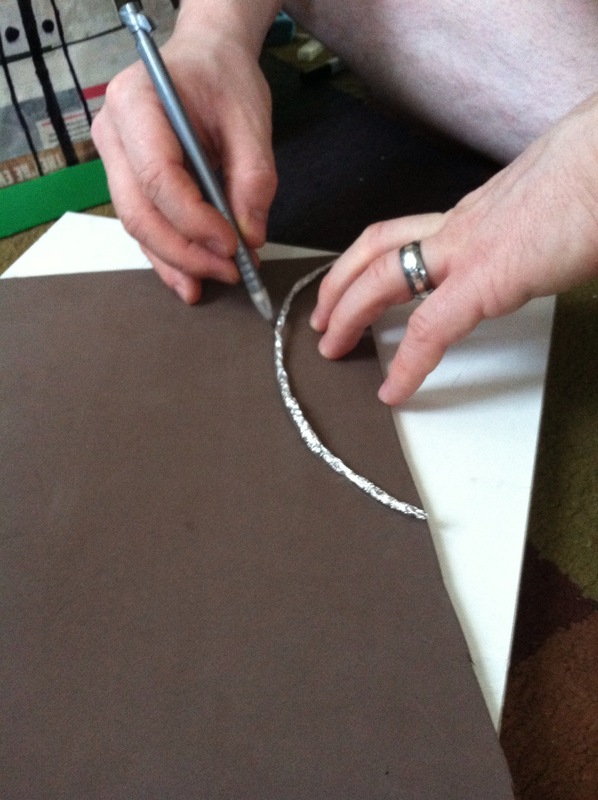 He then took that wire shape and traced it onto some 5mm craft foam and we cut out a first try. 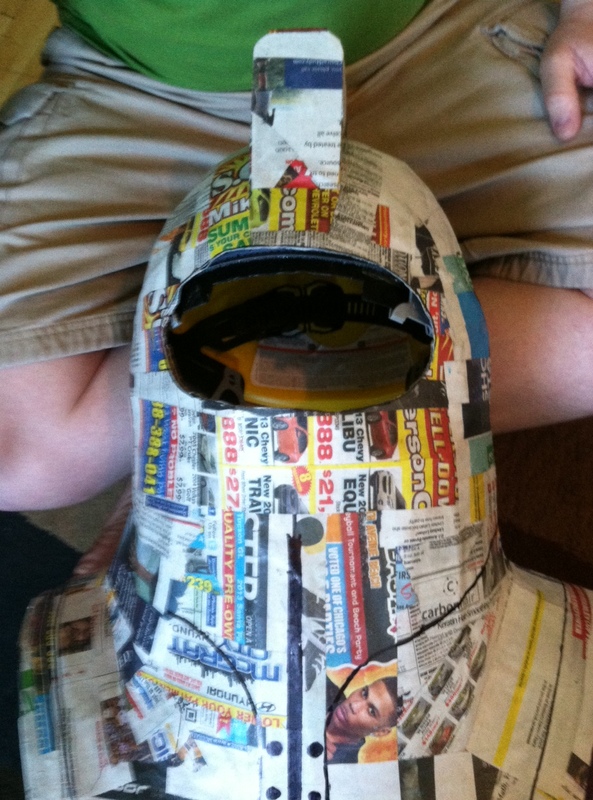 The first try was still off, leaving pretty large gaps between the foam and the actual helmet so Daniel made a few adjustments, looking from the helmet to our new sketches and trying to fill in the gaps. It worked out really nicely! Remember how I told you last week to avoid using scissors on the thick foam? You should still avoid cutting with scissors but you can still shape with them! Daniel had achieved that lovely curve along the edge of the styrofoam by rubbing the styrofoam together and we hated to waste it so Daniel did a little trimming and somehow the cosplay gods smiled on us and the foam perfectly curves into the camera. You might be wondering about that blue strip running on either side of the camera lens. If we take another look at our reference photo you’ll see the carved out lines that run down the front of the helmet and sweep around to the back of the helmet. Since we don’t actually have the means to carve something out of the helmet, we decided to make some raised strips which we will paint a darker color. We’re gonna try to trick you! But this was the first of our tedious tasks. I needed to cut 1/8″ strips out of the 2mm foam and we didn’t actually have a ruler that was long enough to span the whole length of the sheet of foam. 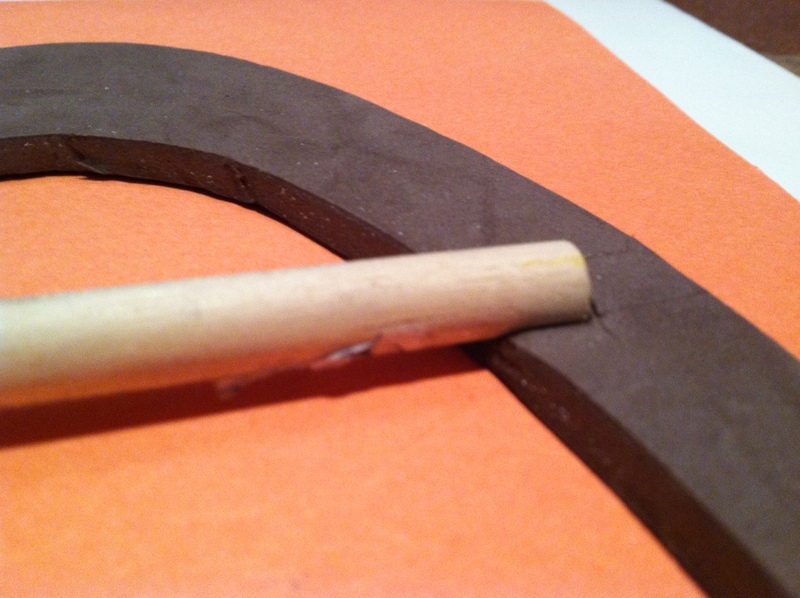 That’s right kids, I was marking with a pencil along the length of the foam 1/8″ at regular intervals. I had to cut 6 strips. 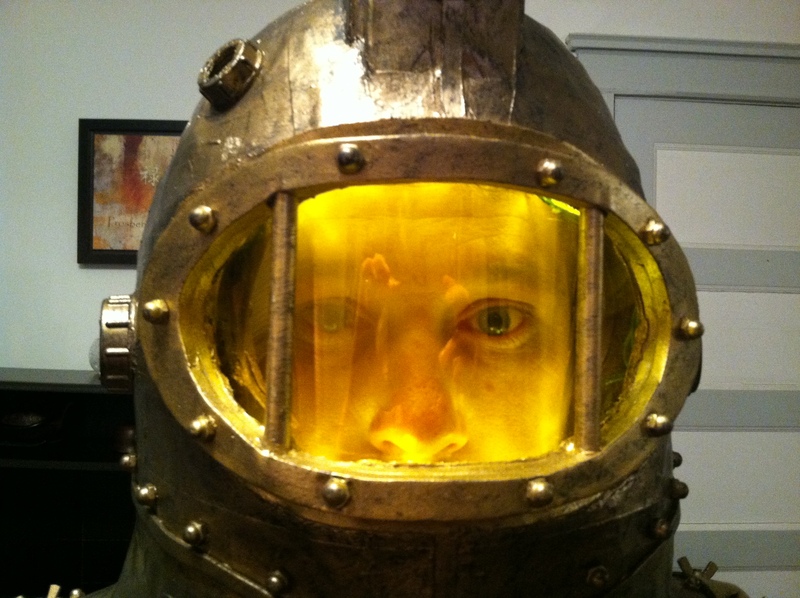 And then we discovered that the thin foam was drawing the eye to the height of the helmet as it split the plain between the lights and the porthole. We thought that if we used thicker strips, it might help to make the helmet look more squat. 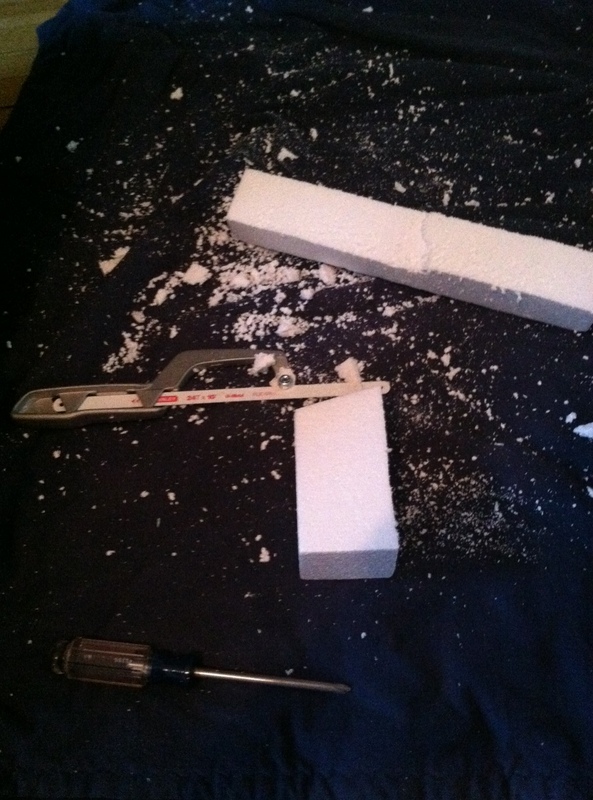 Of course this meant that I needed to cut 1/4″ strips out of the foam. And today was the day that Daniel’s beloved Elmer’s Glue All failed. The adhesive element seemed to have given out because we had diluted it with water for the papier-mâché, so we resorted to hot glue, which worked well enough but now we had those annoying hot glue strings that feel like spider webs when they’re stuck to your fingers. 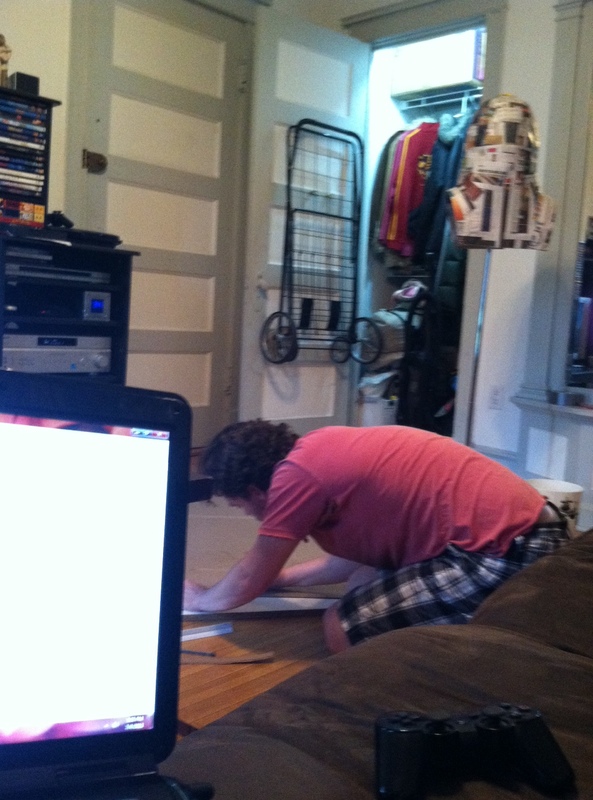 I’m also going to add that we’re doing all of this work sitting on our hard wood floor. After 3 hours of work, we had the foam strips attached and the foam details attached to the camera unit. 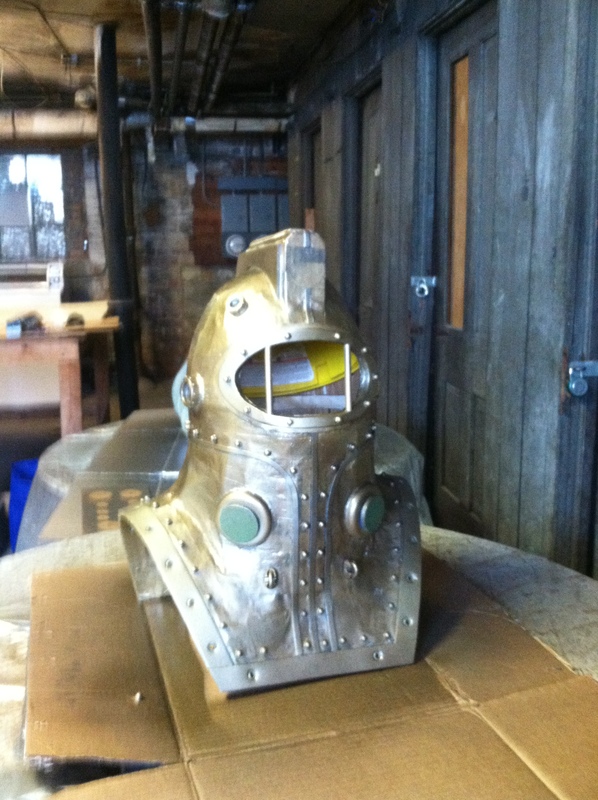 Step One: Line up our guide piece and place the rivet on the helmet. We put some of those 1/8″ strips to use and cut a guide for ourselves. 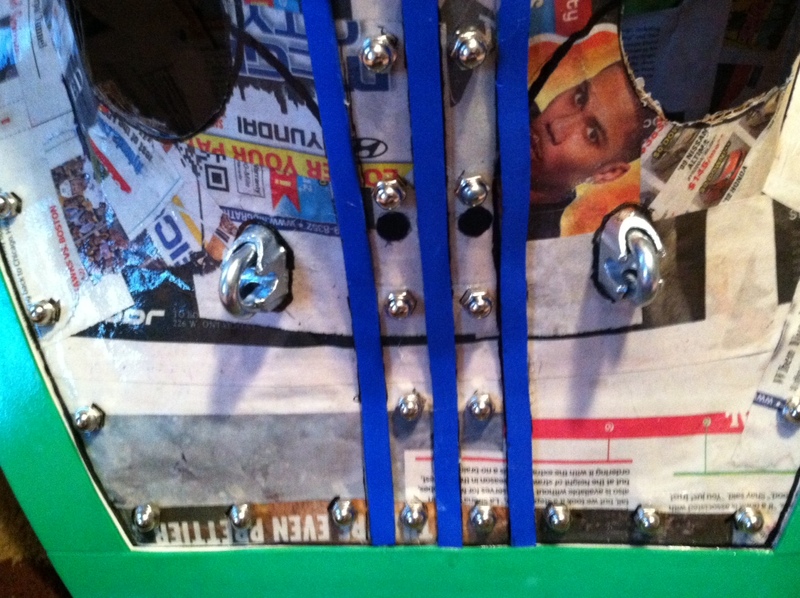 We wanted to make sure that the rivets were the same distance apart. Daniel held onto the rivet with some needle nose pliers and I unfocused and re-focused my eyes to make sure that they were the same distance from the foam lining as the previous rivets. I would give Daniel direction like, a fraction closer to me, no closer to you and he would try to make the minute changes. This proved difficult due to the slick Shellac shell; the rivets kept sliding around. 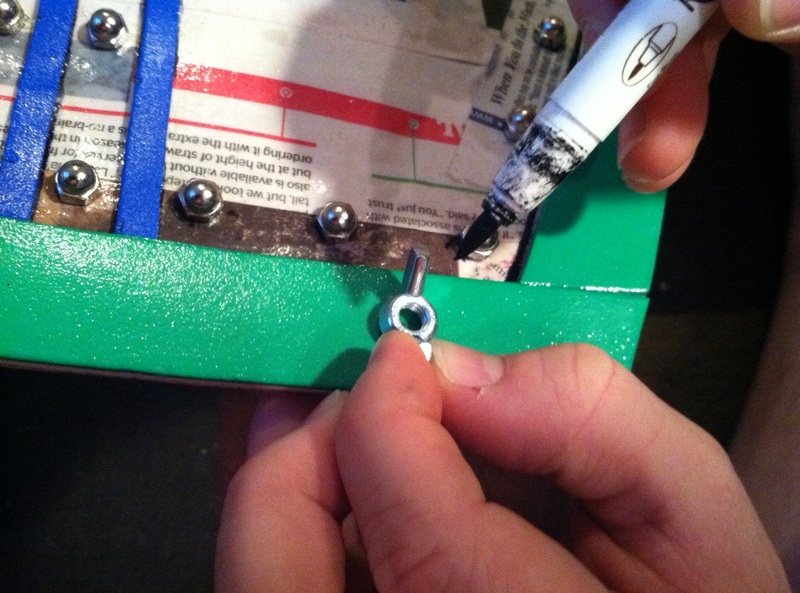 I would then mark one edge with a pen so that Daniel would know where to place the rivet after we’d applied glue. 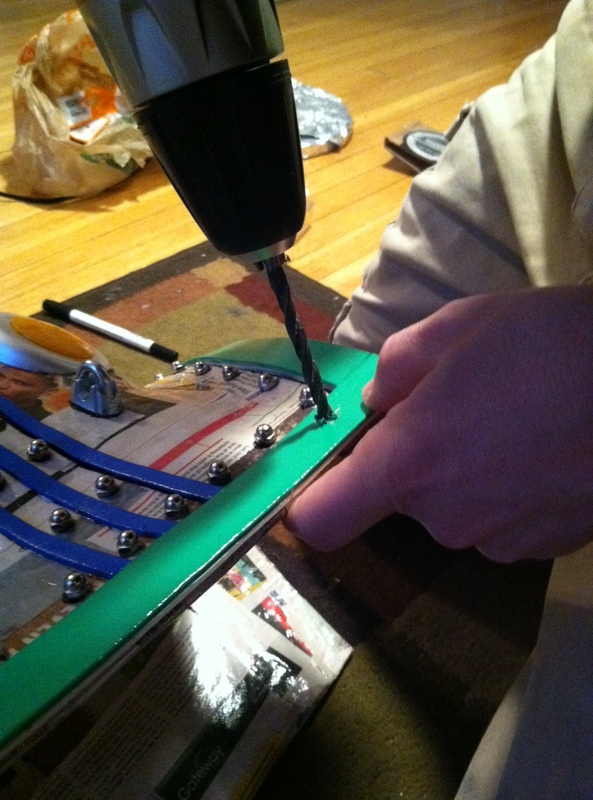 Step 2: Apply the hot glue. 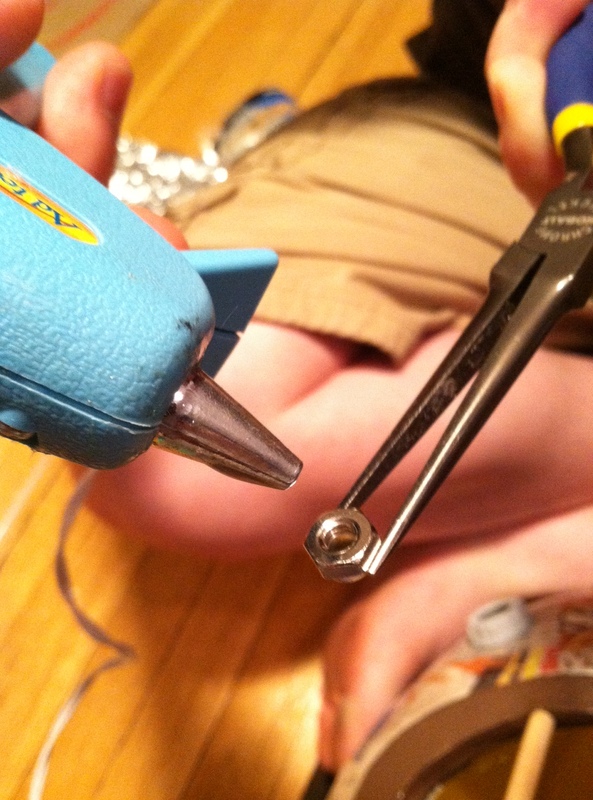 Daniel held the rivet and I filled it with hot glue. 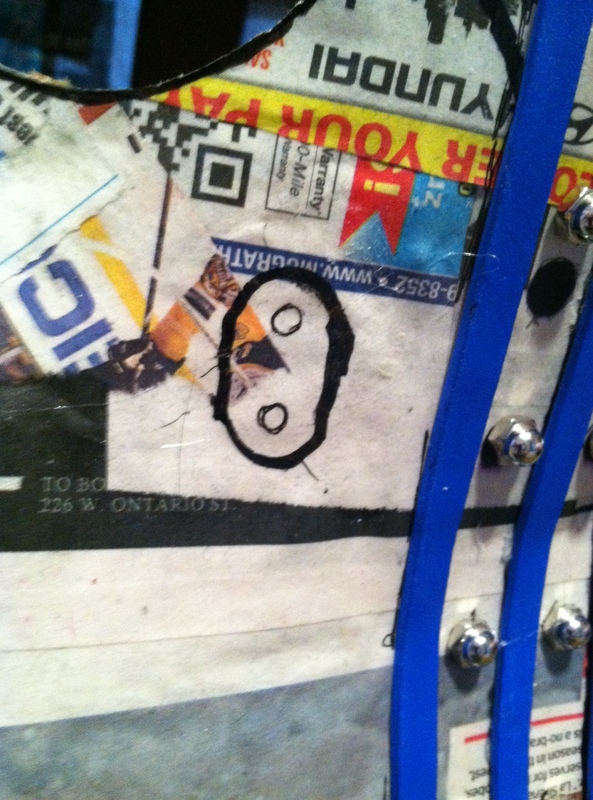 Step 3: Place the rivet. We did this for 4 hours. 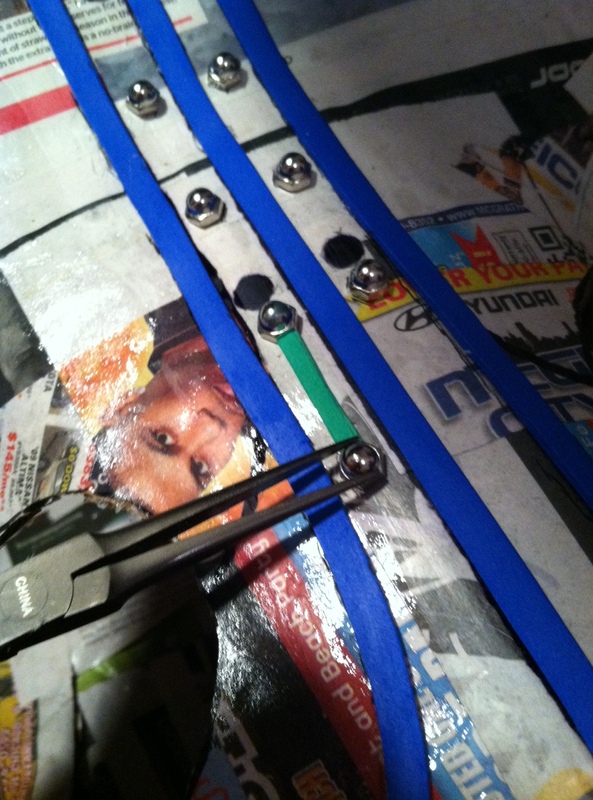 I repeat; 4 hours of sitting on the hard wood floor staring at tiny rivets. 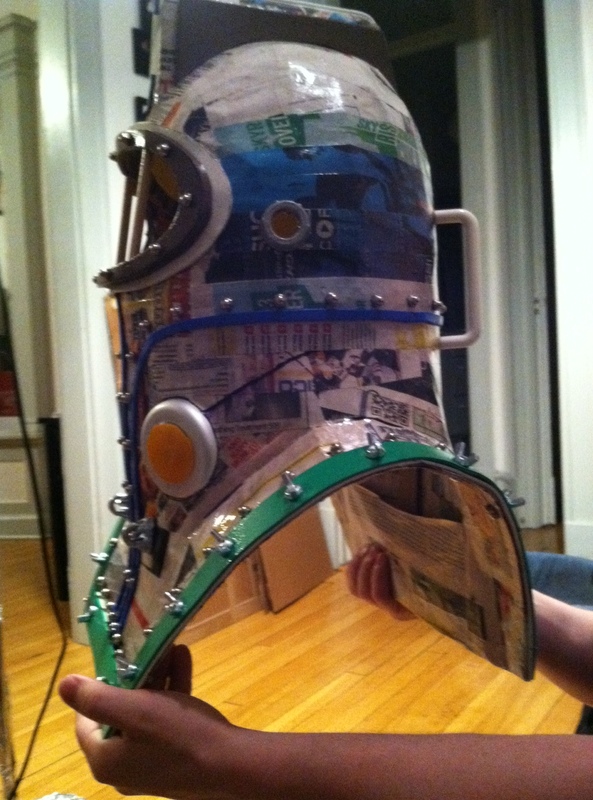 We finished up a 6 hour work day and we hadn’t completed the rivets on Subject Delta’s Helmet but we still felt accomplished, sore and extremely tired. We had worked very hard and stayed very focused and we were still ready and raring to work the next day, after a well-earned night’s sleep of course. Is there more to share? Of course! But one thing we don’t want to share with you is builder’s fatigue. Would you believe that the first draft of this post was over 1600 words? Neither could we! Which is why we trimmed it down just a touch. The next post will finish up our marathon weekend and possibly bring even more awesomeness in picture form. Check back next week for the Bioshocking conclusion of Level 1 – Subject Delta’s Helmet! The port-hole of Subject Delta‘s helmet had just popped out. I, Sara, put my book down and locked eyes with Daniel. There was a manic energy there. He had done it, but what exactly had he done? We shared a collective exhale and then turned our eyes down to our papier-mâché baby. Had we done irreversible damage or had we rocked it? There it was. A huge gaping hole looking up at us from Daniel’s lap. I studied it. Daniel studied it. We looked at each other, wide eyed and silent. 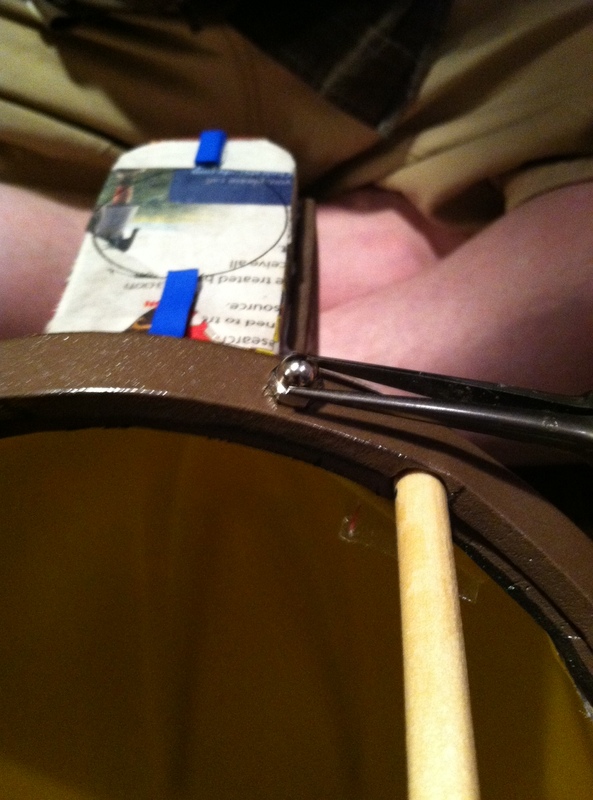 I grabbed the port-hole we’d made out of craft foam and dowel rods and I laid it over the hole. What do you think? Did we rock it? I’d say we rocked it alright! 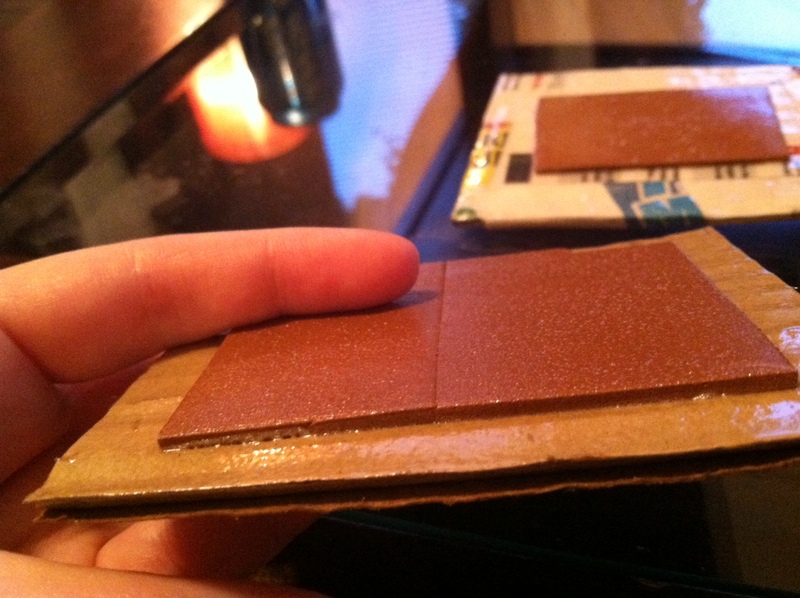 Next, we glued two layers of the 2 mm craft foam along the edges of the harness with Daniel’s trusty Elmer’s glue. 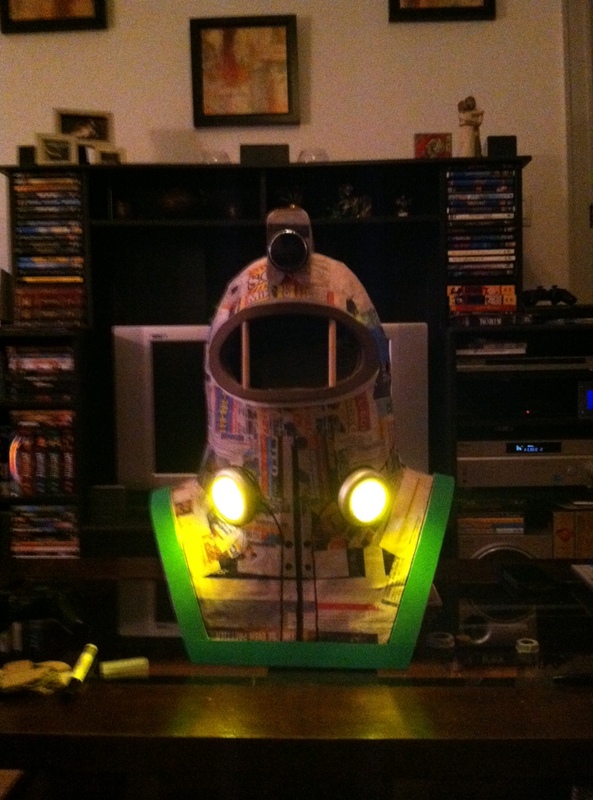 And then, it was time to take care of the two holes for the lights on the front of Subject Delta’s helmet. Again, we searched for ways to delay having to make the big cuts. We had put off the light ports long enough, but our nerves kept us cautious. 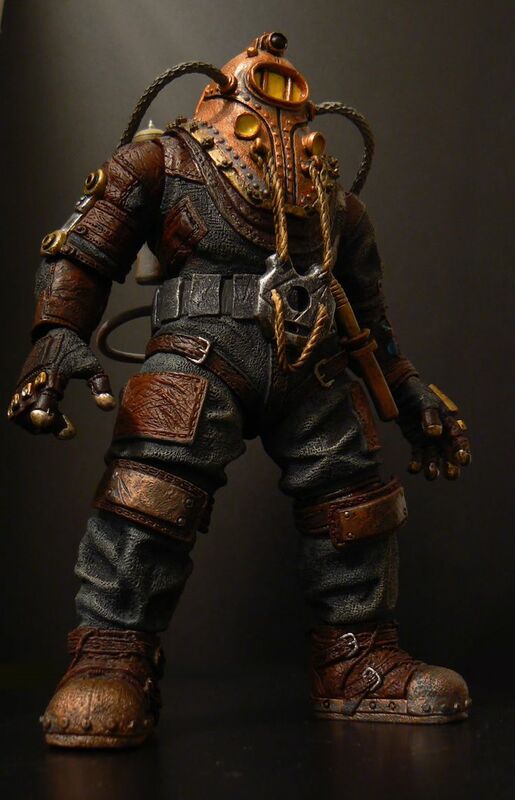 We’d come to accept the fact that our proportions were not going to mimic the references exactly but we didn’t want to position the lights so high on the helmet that the eye would go directly to the tubular shape or our helmet rather than the squatness of the shoulders and harness. We had learned a lesson from the air hose portals; angle and proportioning are more important that symmetry. We sat on the couch positioning card board cut outs of our lights again and again on the helmet. I can always tell when we’re attempting a very stressful step when we start snipping at each other. My directions of “slightly left,””a little up,” and “a fraction more left” were starting to wear on Daniel’s nerves; we were having trouble seeing something three dimensional. We finally had to bite the bullet, trust ourselves and go for it. Daniel did the cutting again, using an X-acto knife just like he did with the port-hole. And once again, we had a helmet with gaping holes looking up at us. We couldn’t tell how well we’d done until we put the lights in. Oh! We haven’t talked about the lights yet have we? 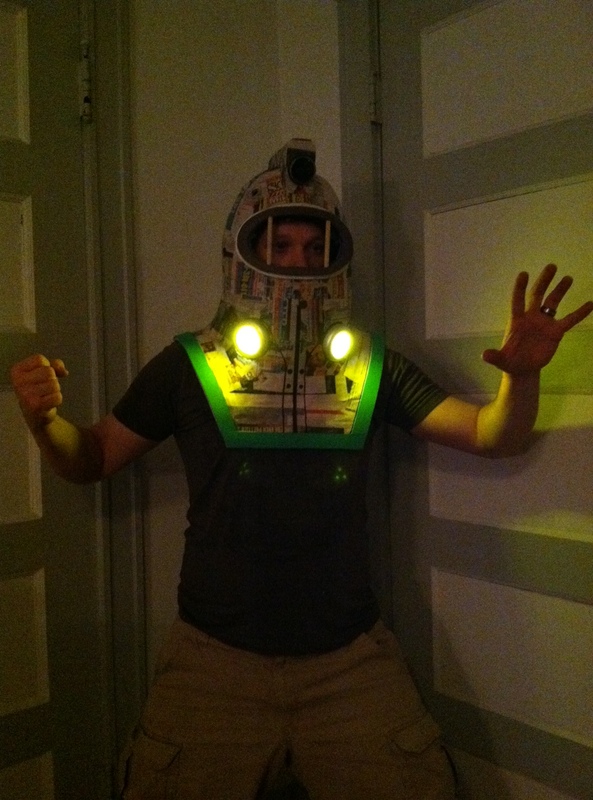 Even though I know you’re all dying to know how the helmet turned out, let’s take a side trip to the lights. We bought a couple of basic push lights but we needed a way to make them yellow since it’s darn near impossible to find them pre-colored. We found a site that said they had them only to find out, after we had placed an order, that they were out of stock and were not planning on restocking. Yes this was frustrating but we knew that this meant we had to be more creative! 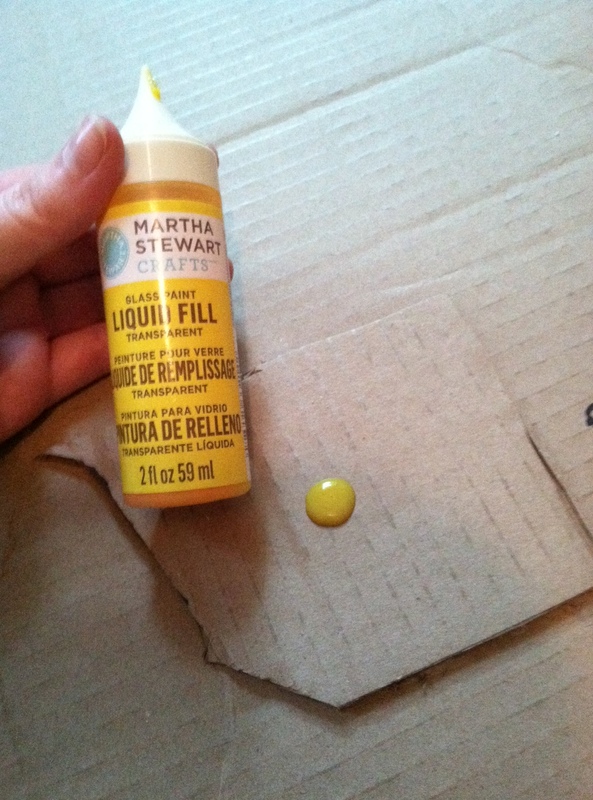 Martha Stewart Crafts Liquid Fill. 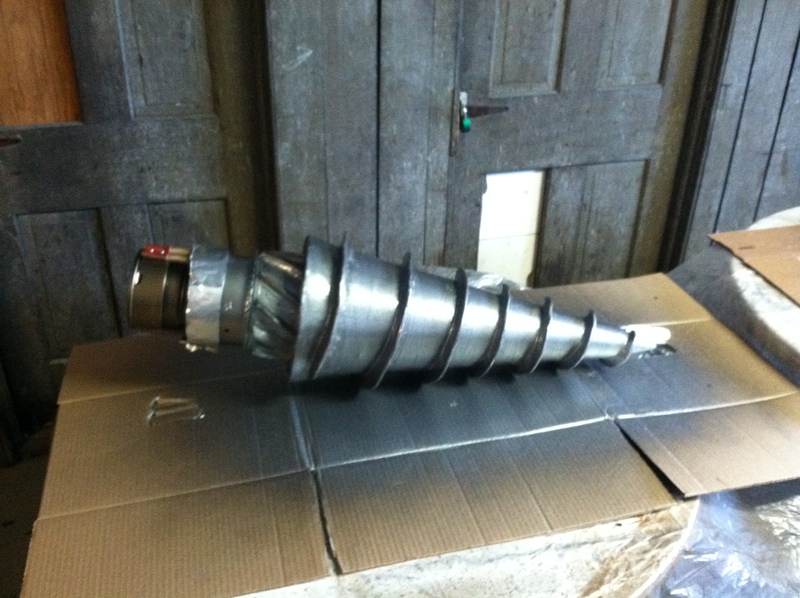 We cut a port-hole sized ring and globbed this stuff into it. We let it dry and our hopes were really high. 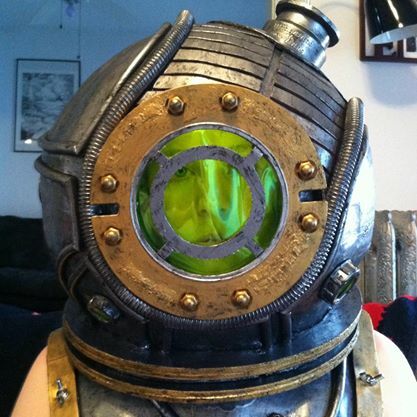 Here’s a really epic picture of Subject Delta’s helmet with the gel. 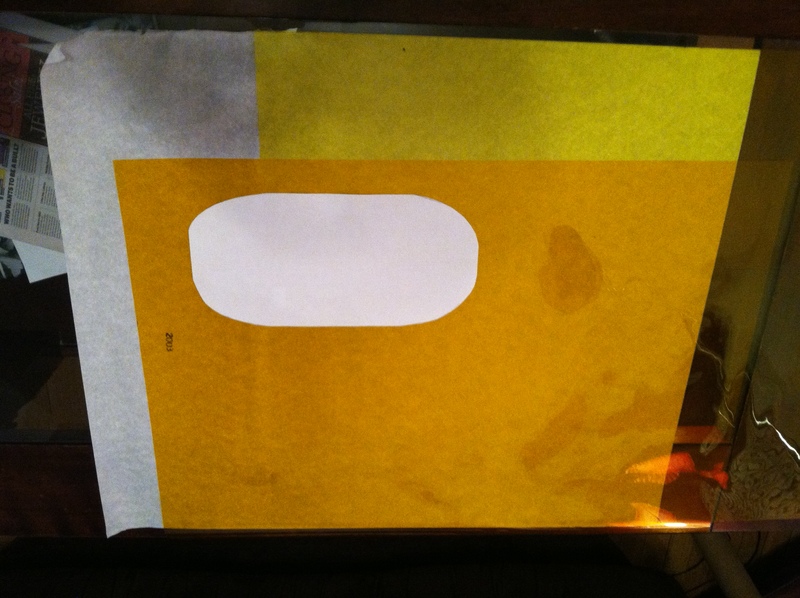 Sadly, it was too opaque and Daniel couldn’t see through it. But we didn’t let it go to waste. Another plus to using this stuff is that it’s clingy and it lets light through… so we put it on our push lights! 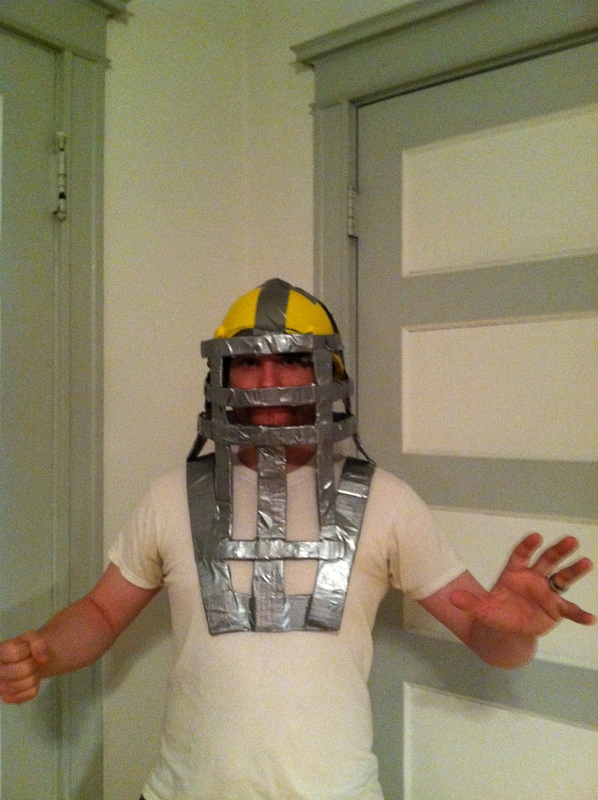 And now, the moment you’ve all been waiting for; how did the helmet turn out? Daniel couldn’t wait to put it on so we’ll close this week’s update with a classic action shot! Level 1-4: Final Save Point — Continue? Good news everyone; we got our supplies! 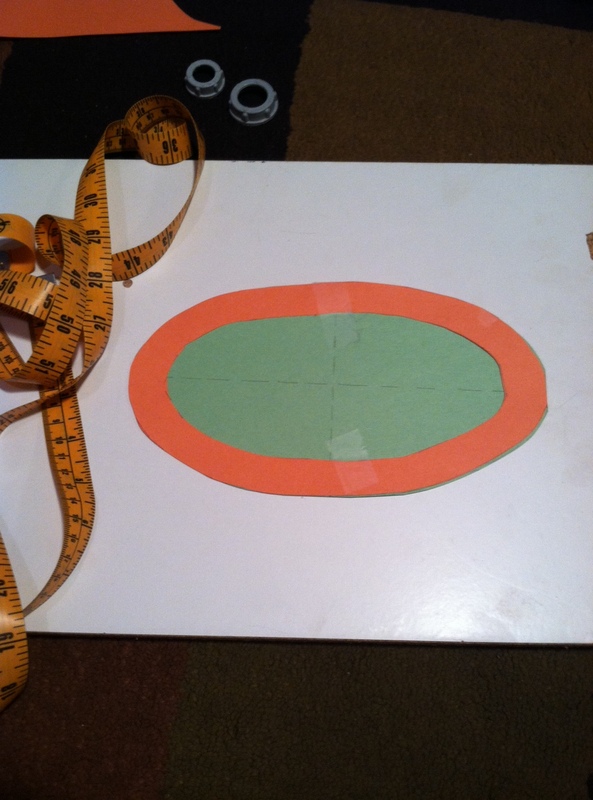 We were waiting on pins and needles for the 5 mm thick craft foam to arrive so that we could begin work on the porthole. While the prospect of making sudden progress was exciting, we were both dreading the moment when we would cut the Subject Delta’s helmet and either make it or break it, so to speak. In keeping with our practice of making prototypes before gluing or cutting, we set out to make a prototype of the porthole. For our first attempt, I did a free-handed sketch using grid on construction paper. While Daniel was mightily impressed by my free-hand ovals, they weren’t as perfect as we wanted them to be. But they did not go to waste; no! We used them to figure out the rough dimensions that we needed and then plugged into Microsoft Paint. Much more exact, don’t you think? 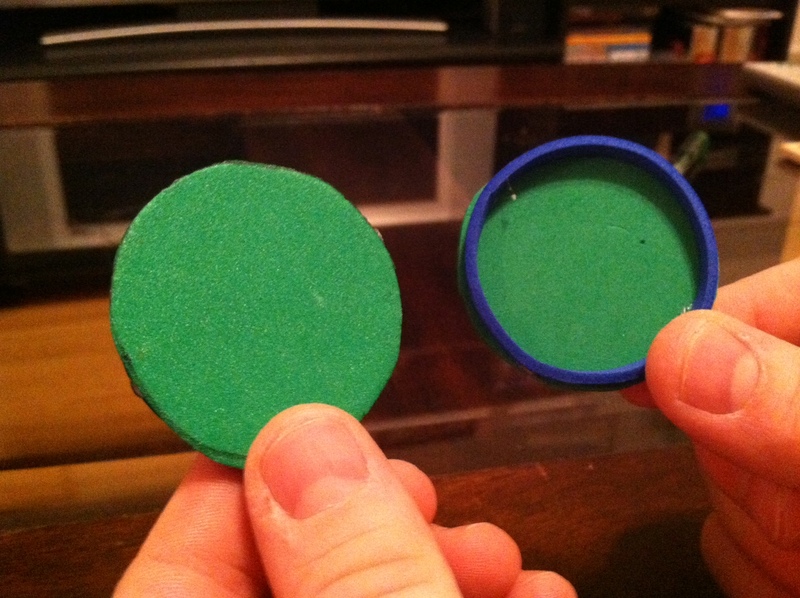 Based on these two templates, we cut our port-hole out of the 5 mm craft foam we had ordered from Hobby Lobby. It was surprisingly easy to cut through with the X-acto knife. However, we found that we needed to cut the entire shape out in one fell swoop rather than starting and stopping in order to adjust the foam; that’s a good way to get frayed edges buddy! 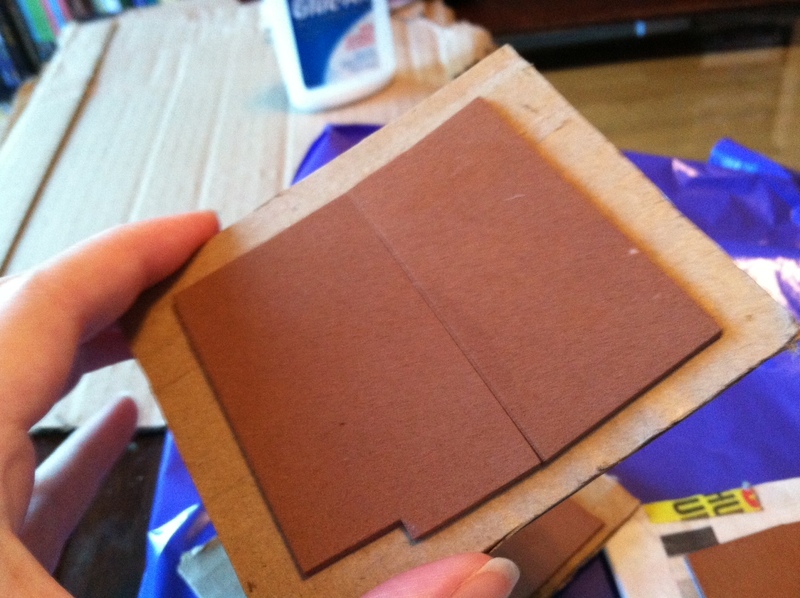 I also wouldn’t recommend using scissors, you’ll wind up with lots of scraggly edges with this thicker foam. 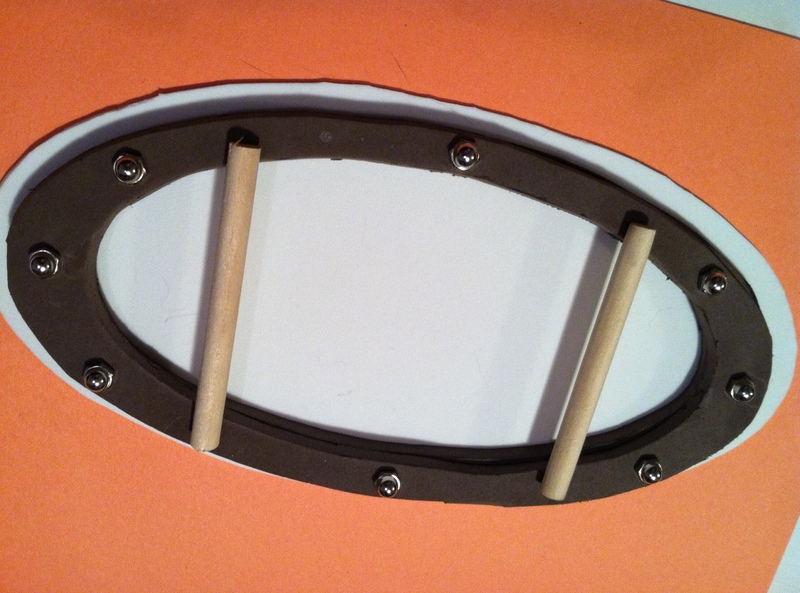 Once we had the ovals cut from the foam, we needed to find a way to attach the bars that run across Subject Delta’s porthole. 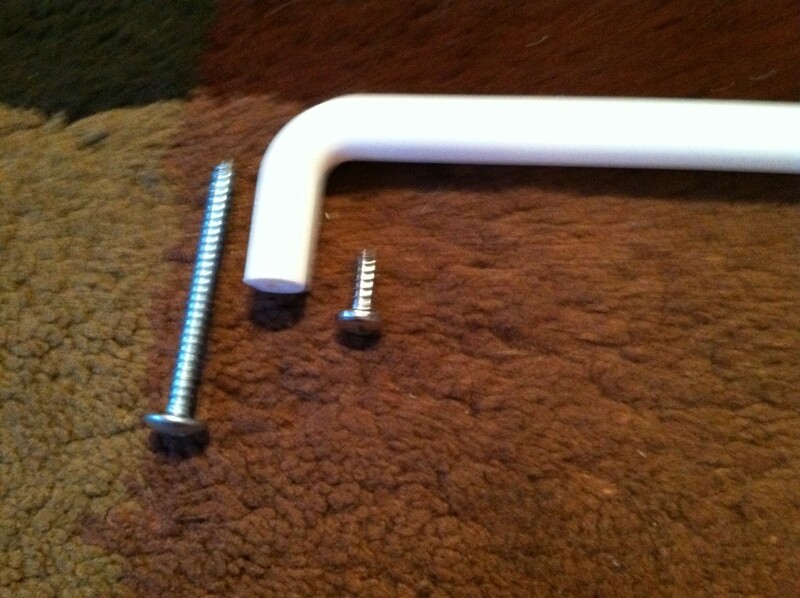 Daniel cut the dowel rods into the sizes we needed with his handy-dandy mini hacksaw and we laid it all out . We even added the rivets so we could begin to imagine it all together; also, we wanted to see if we’d left enough space for them. Once we had ironed the kinks out, the moment of truth had arrived. 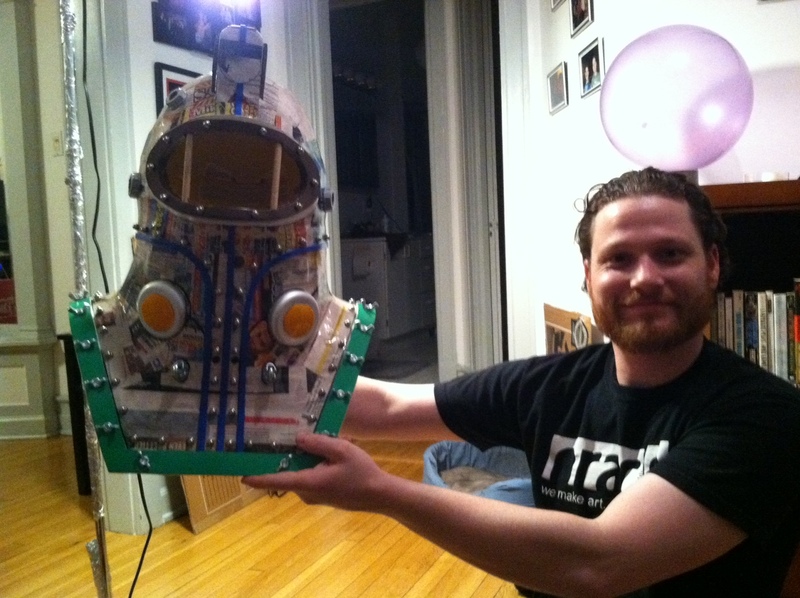 We had to cut the porthole. Tension was high, I kept shaking out my hands and Daniel kept taking these anxious deep breaths and swooshing it all out of his lungs. 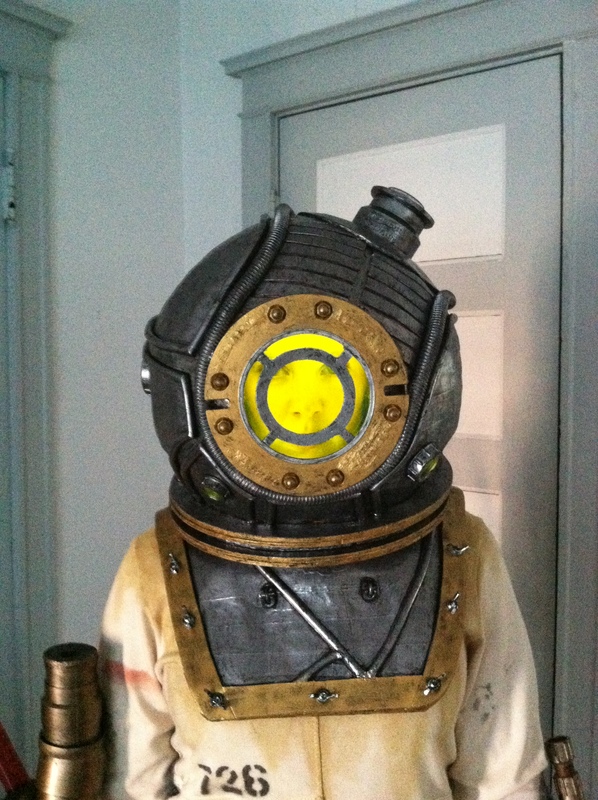 We spent a long time taping cut outs of our porthole and the lights; we wanted to make sure that we compensated for the shape of the helmet with the placement and scale of our accessories. 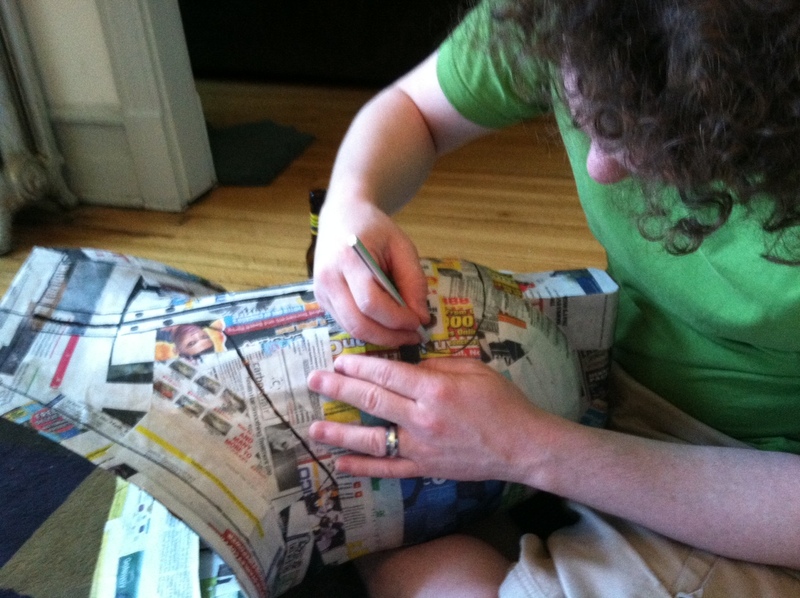 We finally settled on a placement and Daniel took our papier-mâché baby into his lap with X-acto knife in hand. I sat back. The room was silent and the air was thick with nerves and the taste of fear. I picked up my book to distract myself. Daniel put the tip of the knife to the helmet and his fingers tightened, “You’re not going to watch and support me?” he asked looking up at me. I knew that he was just stalling. Did all of our forward planning pay off? Would all of our blood, sweat and tears be paid back in full? Or will Sara have to strangle Daniel with a pliable piece of cardboard from the helmets frame because they have to start all over again? Since the wave of trials and tests and decisions made last week, we’ve hit another slow spot. We knew when we started that Subject Delta‘s helmet was going to be painfully intricate and we’d even anticipated taking extra time to prevent having to re-do all our hard work. What we didn’t plan on was extra shipping time for supplies. Both Daniel and myself had the whole weekend set aside and I was essentially frothing at the mouth to start putting some details on our frame, but all of this hinged on our receiving our supplies on Friday. In case you haven’t already pieced it together, we did not receive our supplies on Friday. And so, we busied ourselves with something that we could do with out our 5 mm thick craft foam, the camera. This camera sits atop Subject Delta’s helmet and we wanted to make sure that it didn’t wind up looking too much like a fish fin or a mo-hawk. We also wanted to make sure that it didn’t add too much height to our already dangerously thin helmet. Since Daniel is neither broad nor beefy, the challenge has been to make this helmet appropriate for Daniel’s stature, rather than trying to force him into a fictitious character’s body, so we wanted to be very careful of the height versus the width of the helmet. We toyed with the idea of adding extra panels to the frame to help fill out the cylindrical helmet to the shoulder harness to help it look more squat but after much fretting and wringing of hands we decided to embrace our artistic interpretation and, to steal from an acting teacher of mine, discover what Daniel would look like if he were to become Subject Delta. I love to carve styrofoam!!! I don’t know why, I just do! It’s like destroying and creating and making snow all at the same time. 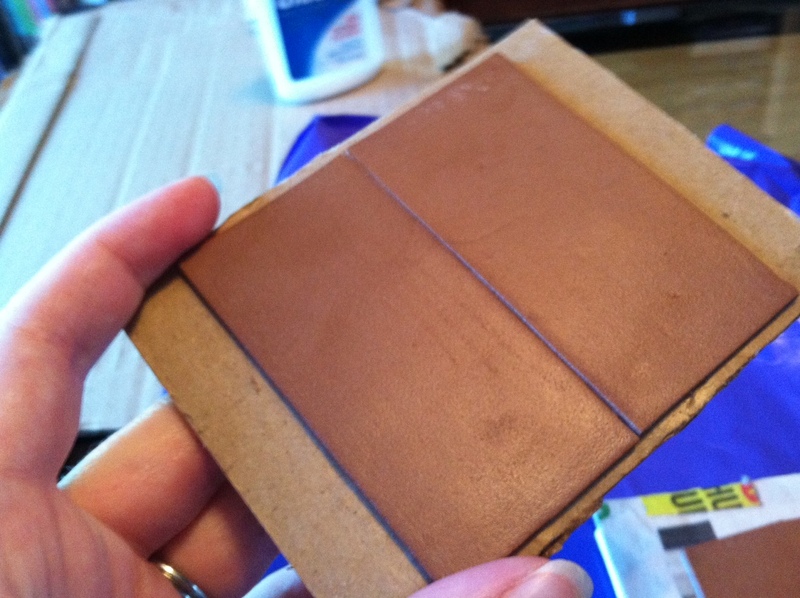 I sat down with our 2″ X 4″ X 12″ styrofoam block and got to crafting. 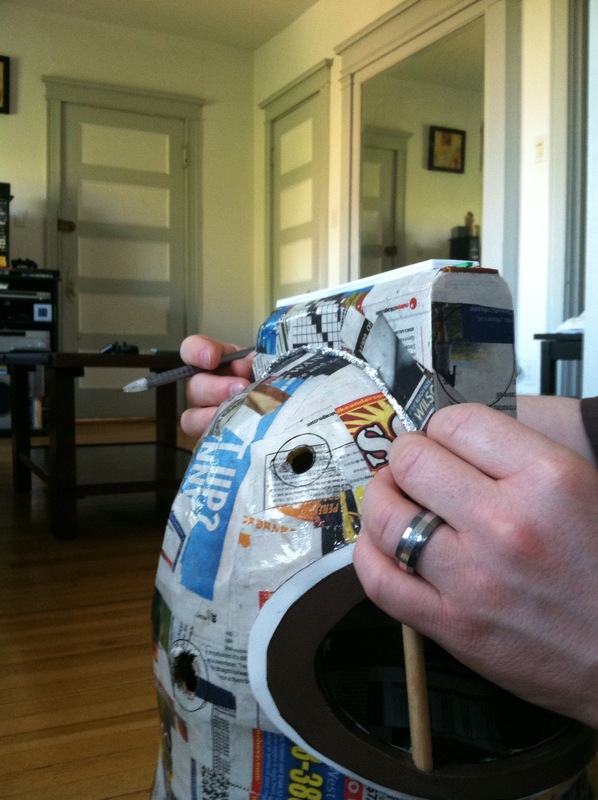 We started by holding the block up to the helmet an tracing the crest of the helmet along one side of the block with a sharpie to get a good idea of how we needed to carve the styrofoam so that it could straddle the helmet just right. I used our trusty X-acto knife to carve out the initial section and sat it on the helmet, carved out a little more, sat it on the helmet again then carved out a little more and sat it on the helmet again. You get the idea; tedious but necessary. It was looking pretty good but needed something else. The hard hat we got has a bit of raised detailing on the top so I carved out a gorge into the curved section so that it would fit more snugly down over the helmet. 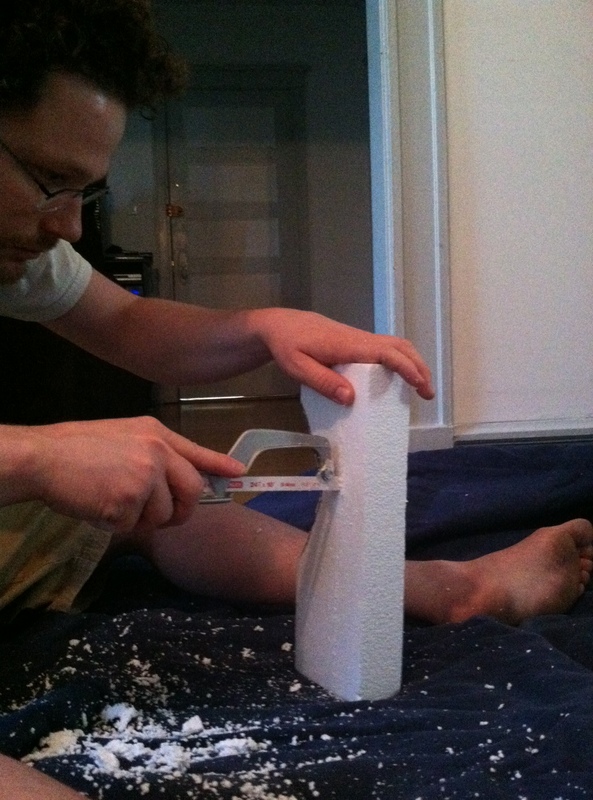 The second time around we just traced the template onto the styrofoam and Daniel got to sawing. When he finished we had a pretty awesome looking camera. And that lens? 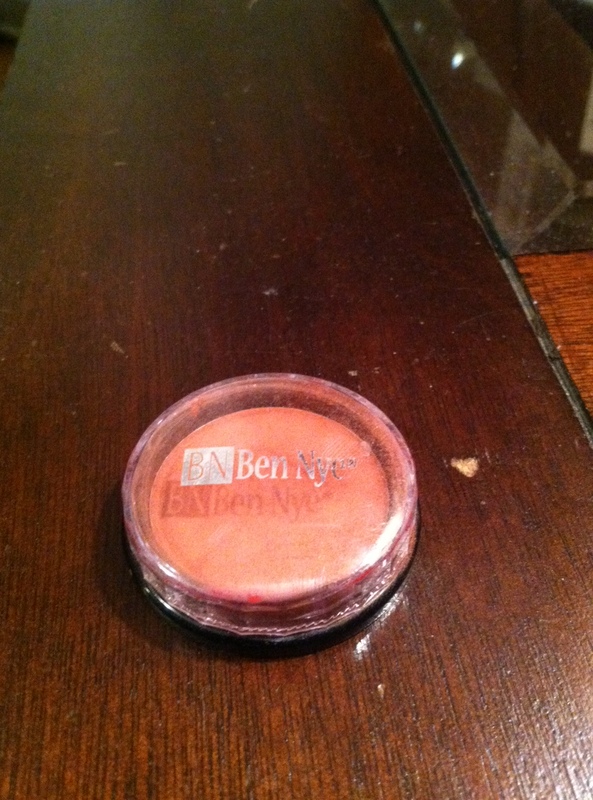 That’s an empty Ben Nye makeup container. We had an empty red makeup container that Daniel cleaned out. Best of all? It was free! Hooray for college makeup class! 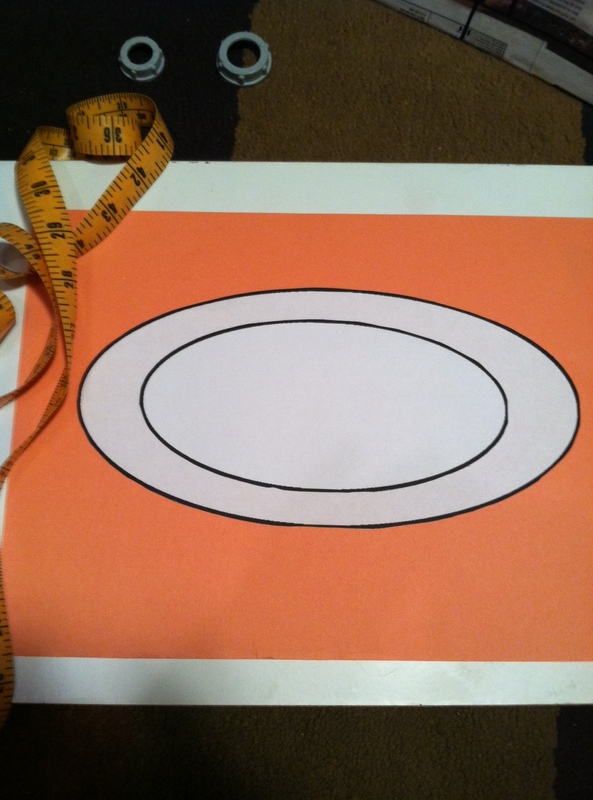 But as I looked at the reference pictures, it seemed to me that the edges needed to be rounded. 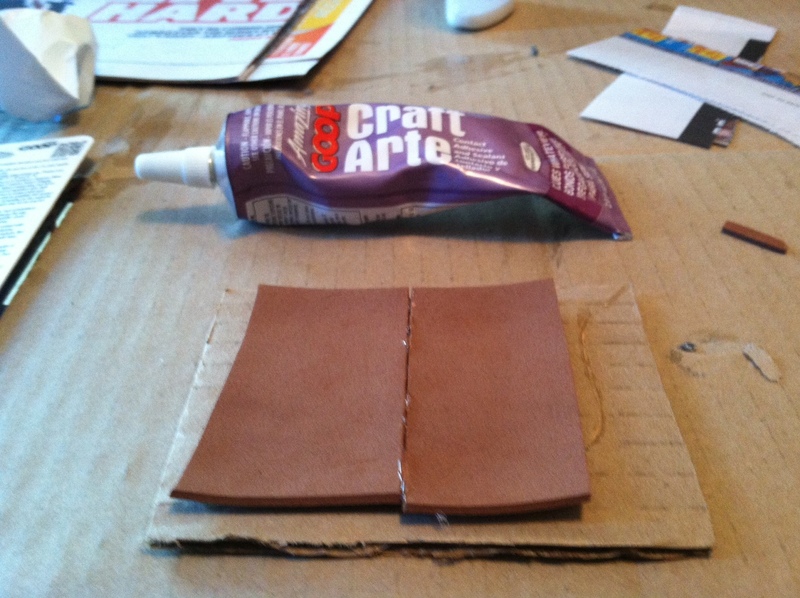 While we were at Michaels, I picked up a flyer titled, “Tips & Techniques for Crafting with Styrofoam.” On it, I learned that styrofoam works like sandpaper on other pieces of styrofoam. I had no idea! Neither did Daniel. I had to convince him to give it a try. He doubted that we would be able to get a smooth rounded look because the styrofoam was too delicate for sanding but once I read the flyer to him and gave him a demo he got to sanding and will you just look at these results? And we know how much you all love the Daniel action shot! We’d like to apologize for the tardiness of this week’s update, but we feel like we have a great excuse. Those supplies that we were waiting on arrived yesterday and we’ve been building after work both yesterday and today. We’re going to have some really really exciting updates to make in the coming weeks, be sure to check it out! A wise man once said, “He who wishes to go far must tread carefully.” Now, just in case you’re trying to Goggle that quote, I’ll come clean; it’s not a real quote. But it does make a good opening for this week’s slightly less exciting post. 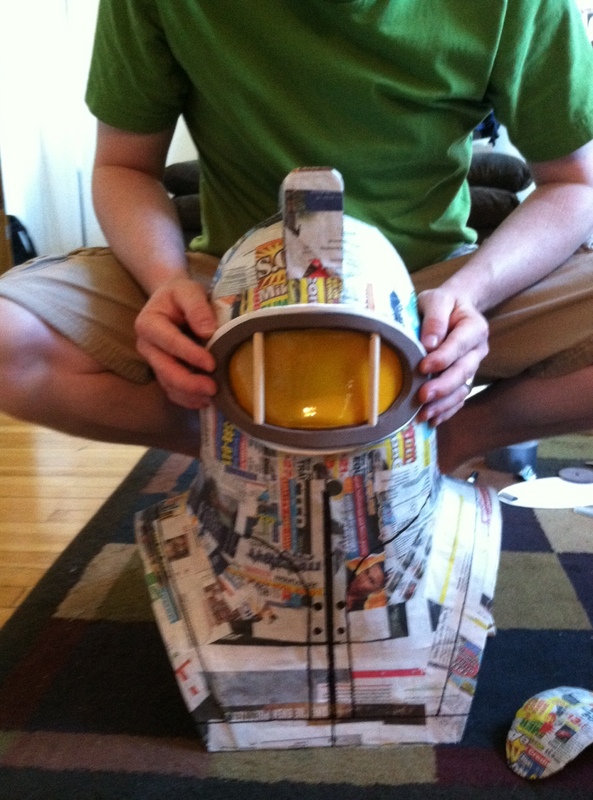 Subject Delta’s helmet was finally coming together and we were beyond pleased with it. I would sometimes catch Daniel just standing in front of it, running his fingers over the papier-mâché whispering sweet nothings to it like you would to a budding flower, or maybe a baby. We knew that the time had come to move into the next phase which would involve adding layers to and eventually making cuts into our hard-earned helmet. Frankly, we were terrified. The thought of making a single cut that could result in having to scrap it again and start over gives me hives. Which is why we’ve decided to take a little time and plan and test and try out some techniques before doing a darn thing to that beautiful piece of work. It was strange not having a firm, physical grasp for the next step. I felt like we were hovering in this unspecific we-need-to-do-something-ness that didn’t have any real direction. So we sat down with a piece of paper and a couple of our reference pictures and got to making a list of layers. Some of the products I had in mind, that would serve our purposes, were: Plasti Dip, spray on fiberglass and spray resins. I’ve worked with all of them before on various little projects here and there growing up. The trouble with Plasti Dip is that while it gives you a nice sealed rubber surface it tends to peel. Spray on fiberglass can be very tricky to work with. It’s heavy and messy, especially when sanding as it gets everywhere and is itchy. 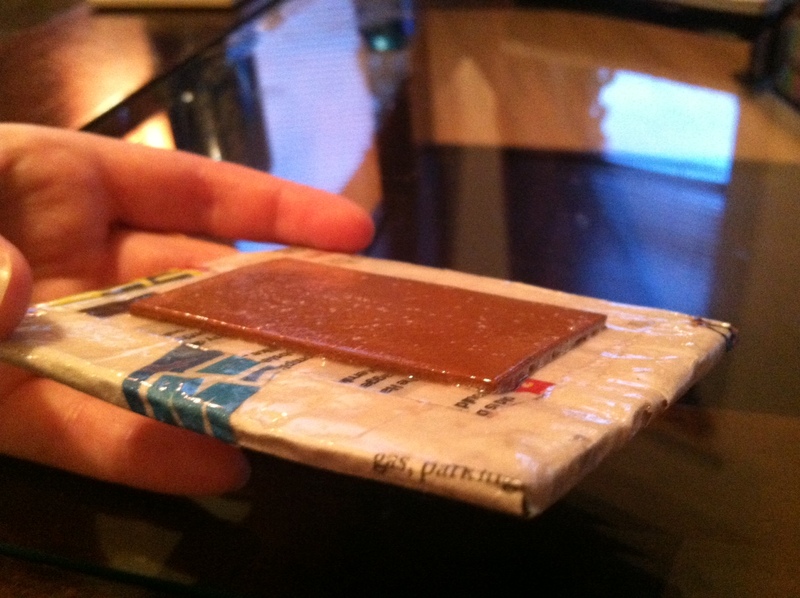 Spray on resins though, are light and can be applied in multiple layers to create a hard, sealed shell. What we have pictured are the two options available to us in the spray on resin category. 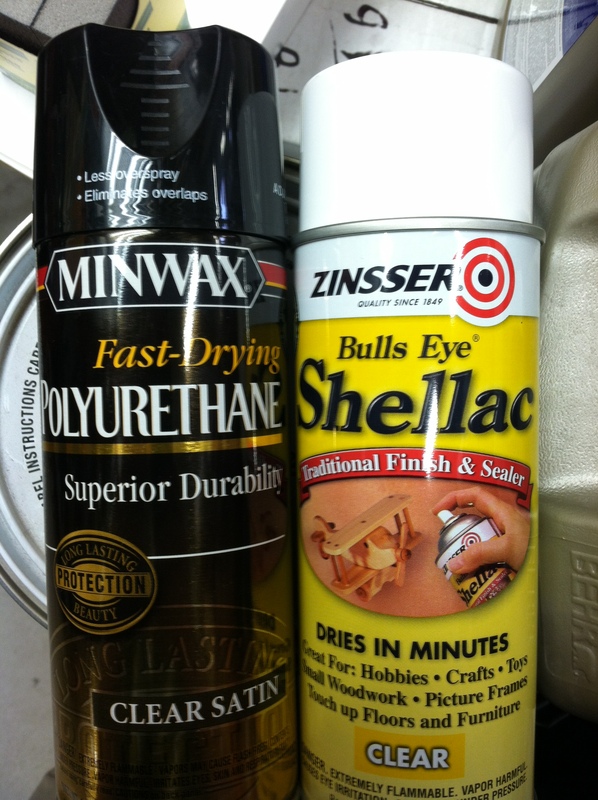 Contestant #1, pictured on the left, is Minwax Fast-Drying Polyurethane. It is primarily used for woodwork such as flooring, molding and doors. It’s used to seal in the woodwork after staining or painting and it dries to a nice hard shell that can be sanded. 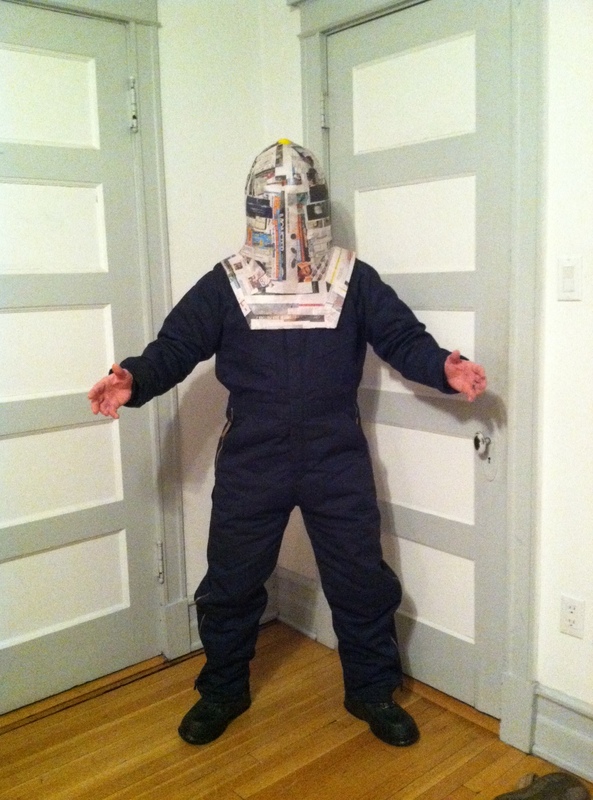 So, with accessories and adhesives and finishing materials in hand, it was time to do some testing. 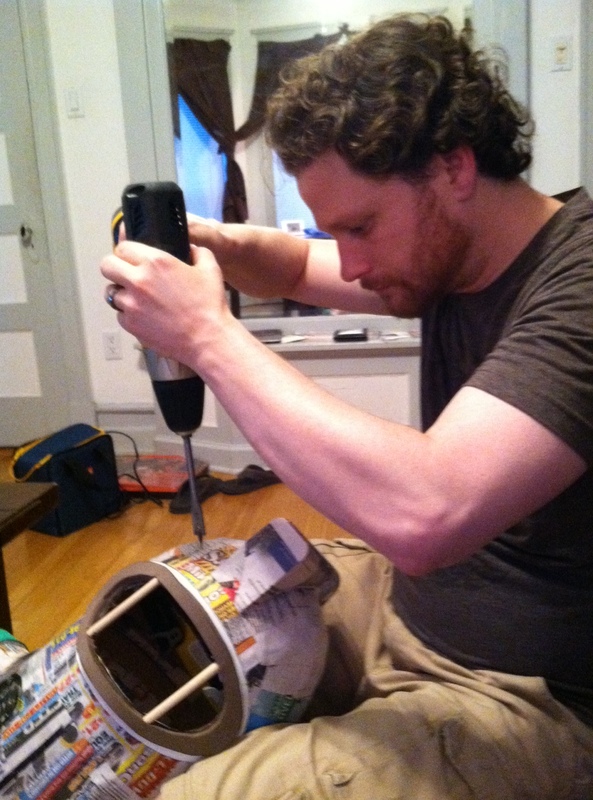 Round One – Adhesive Battle. FIGHT! 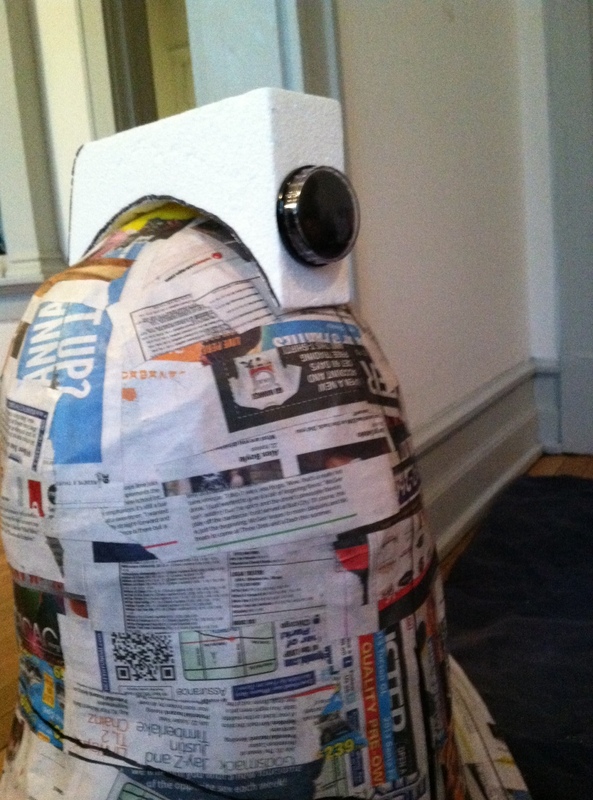 Even after following the directions on the tube which included roughing the edges a little and waiting for the glue to become “tacky” before putting the foam and cardboard together, the edges bowed up. This might have been taken as just a lesson to use the adhesive more liberally had the Elmer’s not turned out so easily and beautifully. Round Two – Finishing Battle. FIGHT! We prepared a set of samples to test the two different finishing sprays on. We were looking to fill in minor blemishes like cracks and creases and we were looking to see what would happen with the porous foam. To prepare the foam, we sealed two samples with the same mixture of Elmer’s Glue-All and water we used to papier-mâché the helmet; this is done to prevent the chemicals of the resin sprays from eating away at it. Starting on the top left and working clockwise we have: sealed foam with seam, sealed foam on papier-mâché, unsealed foam on papier-mâché and unsealed foam with seam. This is what unsealed foam looks like in the light. This is what the sealed foam looks like in the light. When working with any sort of product that is sprayed on, always make sure to work outside or somewhere with excellent ventilation. The fumes can get pretty heavy, even when working on such small samples we could see it hanging in the air. 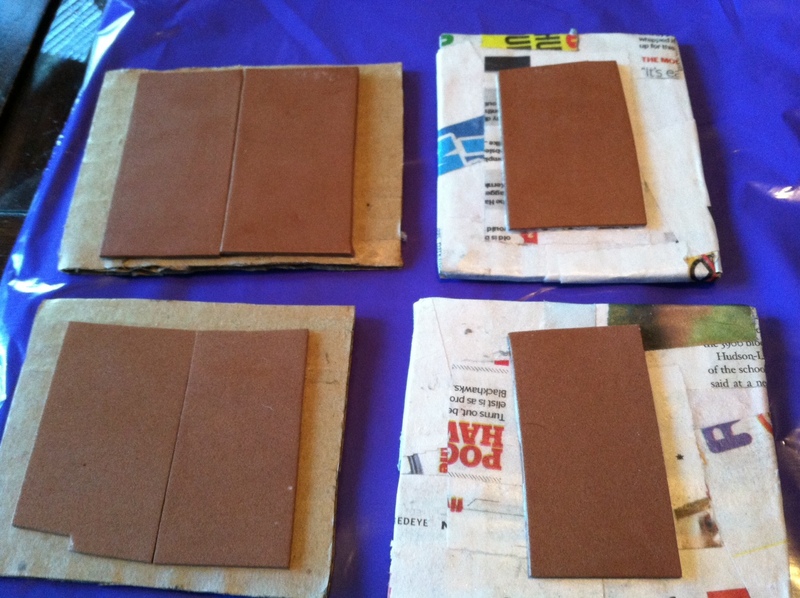 We tested the sprays on a set of sealed and unsealed samples, layering on a total six coats. And, completely unintentionally, we were banking on opposite products for the win. Both the sealed and the unsealed foam are smooth and the edges, where the foam meets the cardboard and papier-mâché, are sealed nicely into one piece. If you were to slap a coat of paint on either of these it would look like one uniform material. And, based on this test, we may not even have to seal the foam as the unsealed foam in Sample 2 appears a bit smoother than the sealed foam in Sample 1. These are the polyurethane tests. Sample 3 is unsealed and Sample 4 is sealed. If you’ll look along the bottom of Sample 3, you can see that there are still gaps between the foam and the base and the imperfections from the papier-mâché are still quite clear. 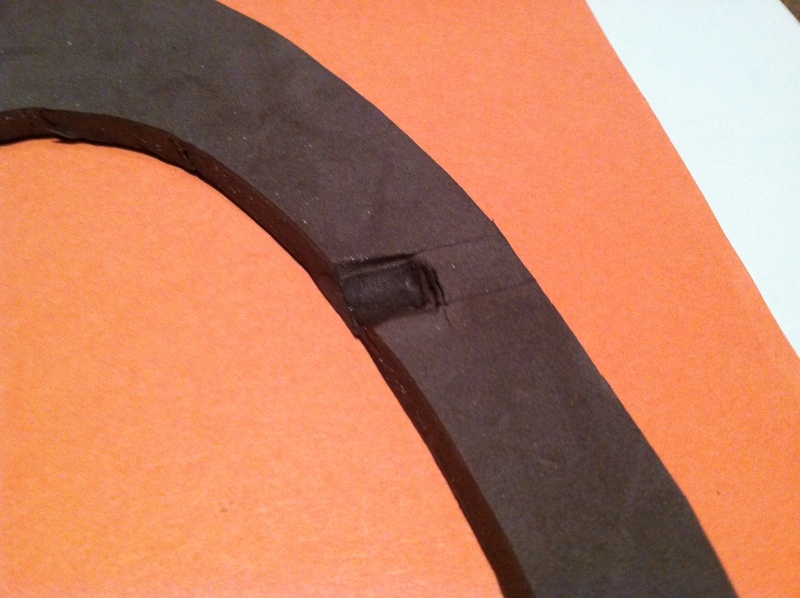 In Sample 4, the seam where the foam was glued together is still clearly there as is a definite ridge between the base and the foam. Do you have a story about a time you wished that you had “measured twice?” Or maybe when you’ve tested out a new technique – how did it turn out? Why not share it with us in the comment box below? 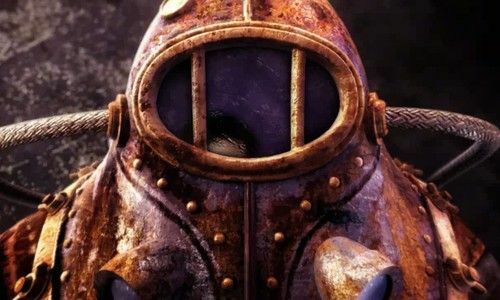 Level 1-2: Press Start to Replay? It was a long and frustrating weekend. 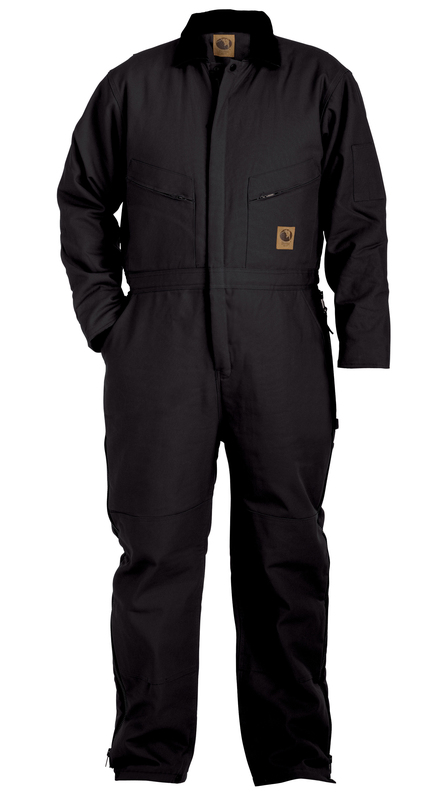 That being said, we started with a couple of fantastic finds that got us really stoked: the jumpsuit and the boots for Subject Delta. We were going to buy me some new clothes and just happened by this store called Uniforms To You and Daniel said, let’s go take a look and I was feeling particularly adventurous because I was about to get some new clothing so I said why not. And here’s what we found.. on sale. 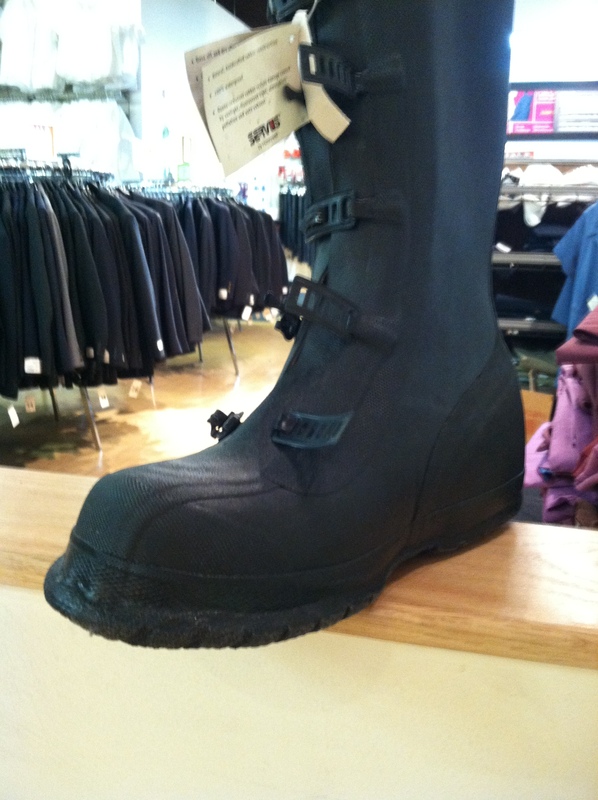 The boots were normally $45 and we got them for $30. They are designed to go over another pair of shoes so they fit perfectly over Daniel’s Chucks so he’s going to be able to wear some comfy shoes and, let’s face it, those buckles look awesome; slap a little bronze paint over those buckles and we’re almost ready to go! I even had him walk around, first with an affected walk, trying to emulate Subject Delta’s movements, and then I asked him to try to walk normally. Those suckers gave him a character perfect walk without him even trying! Anything to make his time in the get up easier, right? The suit was normally around $150 and we got it for $73!! Holy crap right?! It adds all the bulk we want so he’s not going to have to mess with any sort of padding to help making him look larger than life. 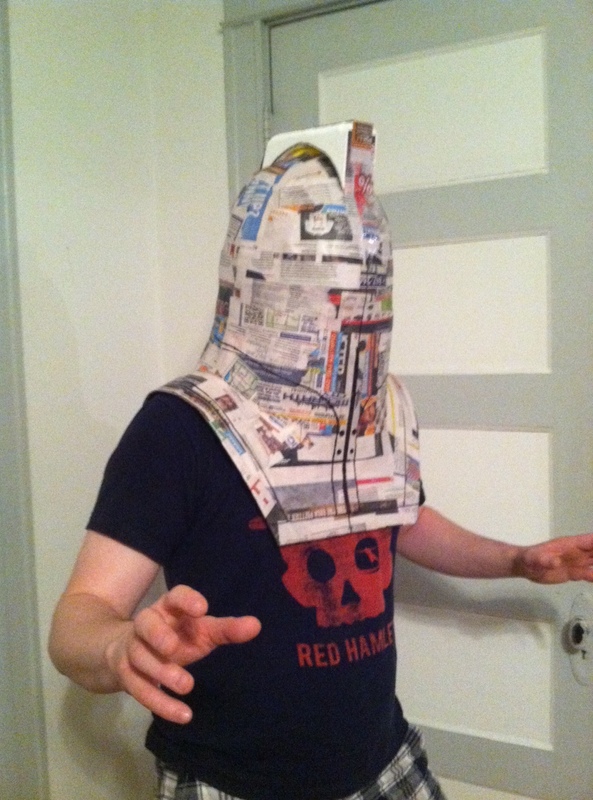 He was surprised how breathable it was, but then it is actually meant to be worked in so I guess that’s just a plus of finding something functional over a straight up costume piece. What great luck! Since we were so close to making Subject Delta’s helmet the first time around, we just knew that we could whip it up on a dedicated Saturday. 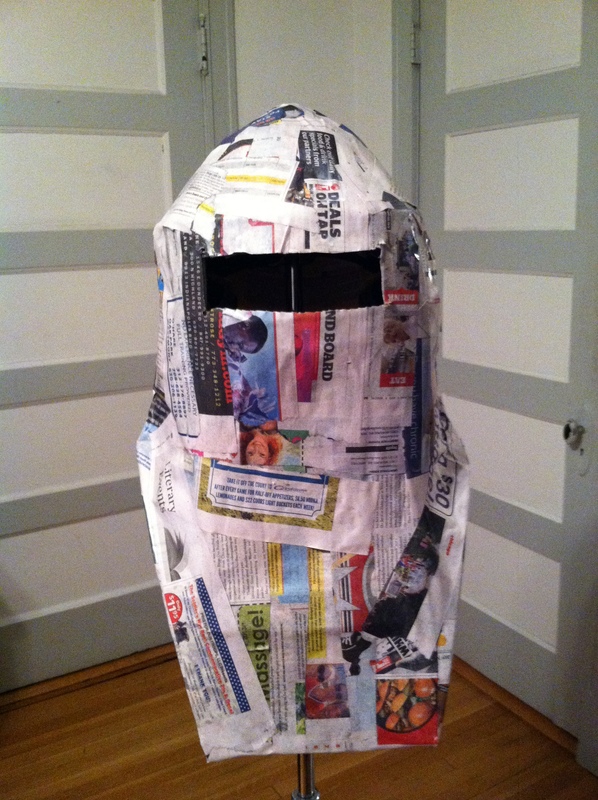 The plan was to make the frame in the morning, papier-mâché in the evening and have our helmet completed and ready to go by dinner time. Easy as pie. Right? Have you ever actually made a pie? We cut our strips of card board again as well as a million strips of duct tape in advance. Daniel put on the coveralls and the newly stripped construction helmet, gave me a kiss and a word of encouragement and then we went to work. We decided that he should stand so that his sitting posture wouldn’t affect the shape of the frame. We had an actual tape measure as well as chalk so I could mark his suit up – I felt like a pro with my tape measure around my neck , bobbing and weaving around my subject. What we didn’t take into account was the humidity and how this practical suit would absorb his sweat. Duct tape may be darn close to perfect in any situation, but it will not stay stuck to a damp cloth surface nor will it stay stuck to the surface of another strip of duct tape. He finally got to sit and he pulled the helmet off and I watched, angrily, as 4 hours of work sloughed to pieces in his hands. I was disgusted and Daniel was in pain and we were both disgusted. We ate a very sad lunch, watched a movie. And then we took another stab at it. Bad decision. I had a full on melt down during which Daniel said “Maybe we should be doing this right now.” To which I said, “I’m really sorry,” and retreated to the bedroom to read some comics and wallow in my shame. The next day Daniel didn’t mention the helmet. After breakfast I looked at him and said, “I need to get that helmet done today.” He asked if I was sure, and I was. We went and purchased some plastic packing tape. It’s sole purpose is to stick to card board right?! This time he sat and we didn’t talk a lot. It was all business. It took us 3 1/2 hours. Would you like to see how it turned out? Shortly after we completed work on the new and improved frame, our friend Wyatt stopped by. So we took a couple-hours break in which we watched the second half of Despicable Me and grilled some red hots to snack on with potato salad. Yum! Fed and rested we were itching to begin the papier-mâché on this new frame to see if we truly did as well as we thought. 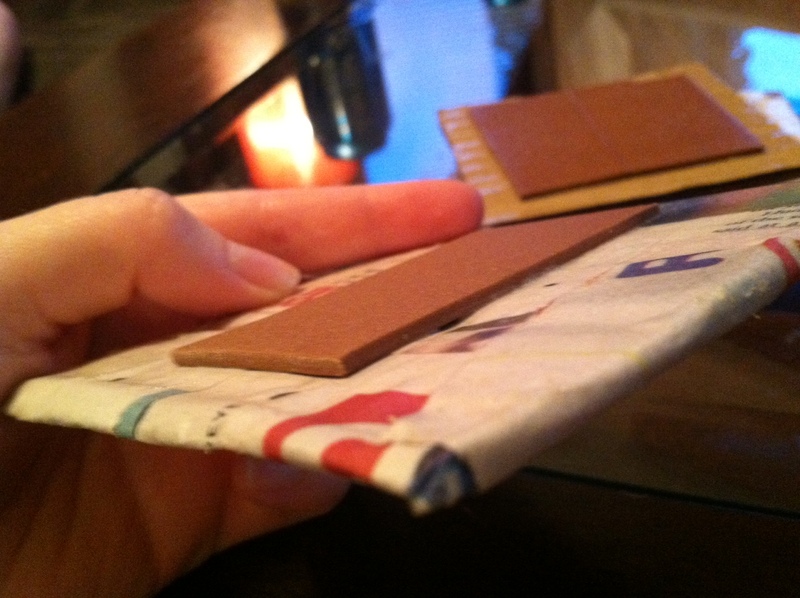 We cut up yet another Red Eye into 1″ wide strips, mixed our glue and set to work. Sara and I started off alternating. She would lay a strip while I held the helmet steady and then I would lay a strip while she held it for me. After only a couple of turns in this way, I asked Sara if she would mind letting me take the reins since I was unable to help with the frame. She was hesitant, maybe a little grumpy at first but I told her that she’d done all the building and that I really wanted to contribute. So she lounged on the couch and watched TV while I worked, giving me a bird’s-eye-view bit of direction here and there and when I asked for her thoughts on a particular section. With the first helmet we layered the papier-mâché onto the frame a little too heavily and ‘painted it on’ with too much glue. The result was that the paper clung to the frame creating subtle valleys and crests and amplifying mistakes. My focus this time around was to let the paper do the work; to lay it on the frame in a way that it would follow the natural contour of the helmet and, where needed, bridge the gaps over any defects. 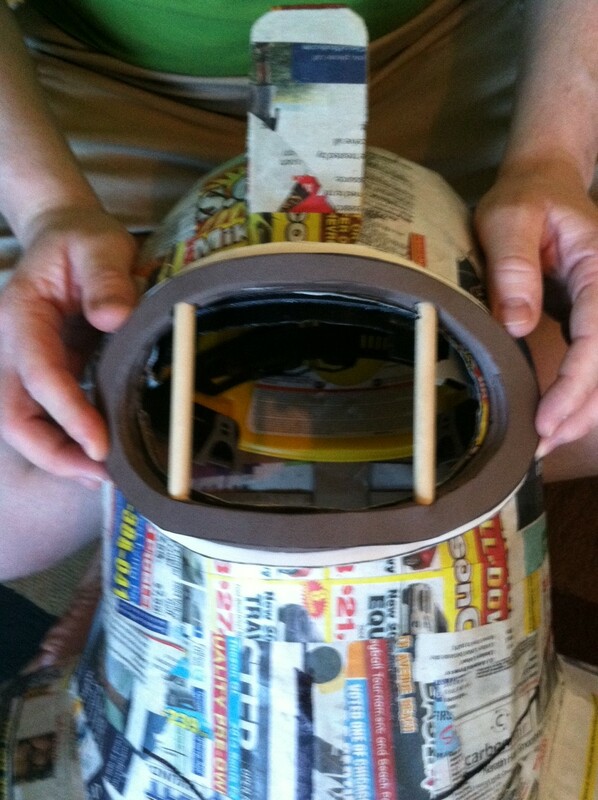 As I started I was using longer strips about 6″ long, but the further up the helmet I worked, the shorter I found the strips needed to in order to follow the various shapes of the helmet without creating folds or crinkles. 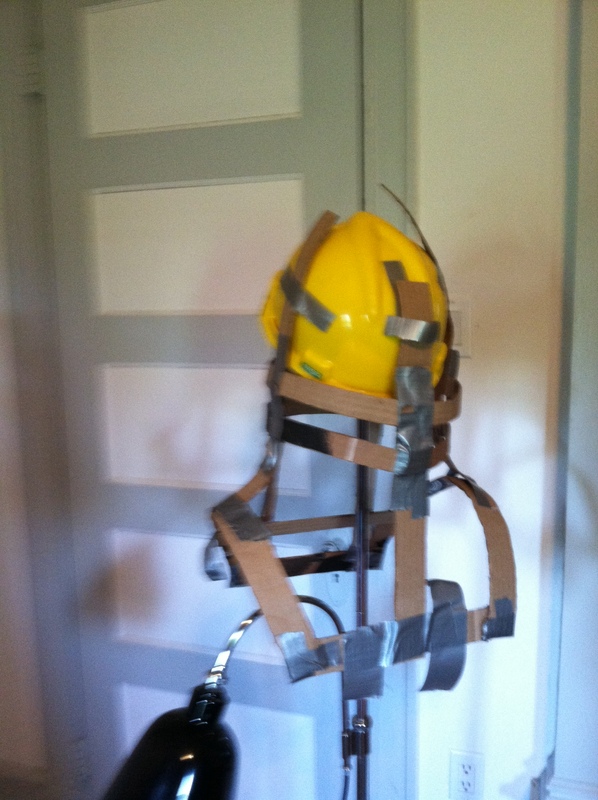 I went from 6″ longs strips on the harness to 3″ and 4″ strips around the transition from the harness to the shoulder/neck junction, to 1″ and 2″ strips around the brim of the helmet and finally 1/2″ patches to conform to the rounded crest. As I worked I also made sure to alternate between horizontal and vertical placements where needed. 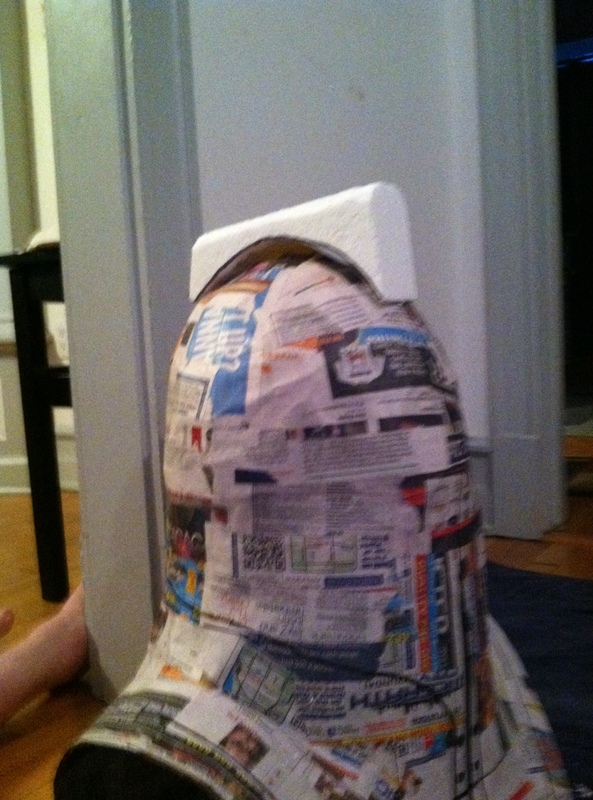 The more I applied the more we could see just how amazing and improved the overall shape was! After about 2 hours of sculpting and scrutinizing the initial layer was complete. It was time to call it quits for the night and clean up; but the finished product for the day left us feeling accomplished and very hopeful. Sara, still feeling the sting from the previous day, freaked out about the right side of the harness. I thought it was good enough. We argued back and forth about whether or not it was even possible to put extensions on the harness, I was stressed that we would ruin the amazing work we’d already done. 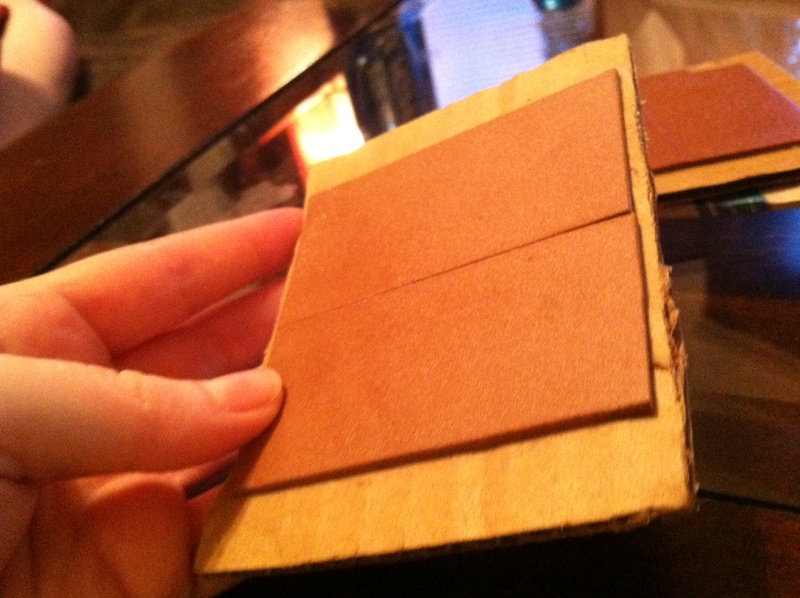 But she bent me to her will, like she did those cardboard strips and look how it turned out in the picture on the left. 17 hours in and this is what we’ve got. We hope you enjoyed our new format and the progress pictures! 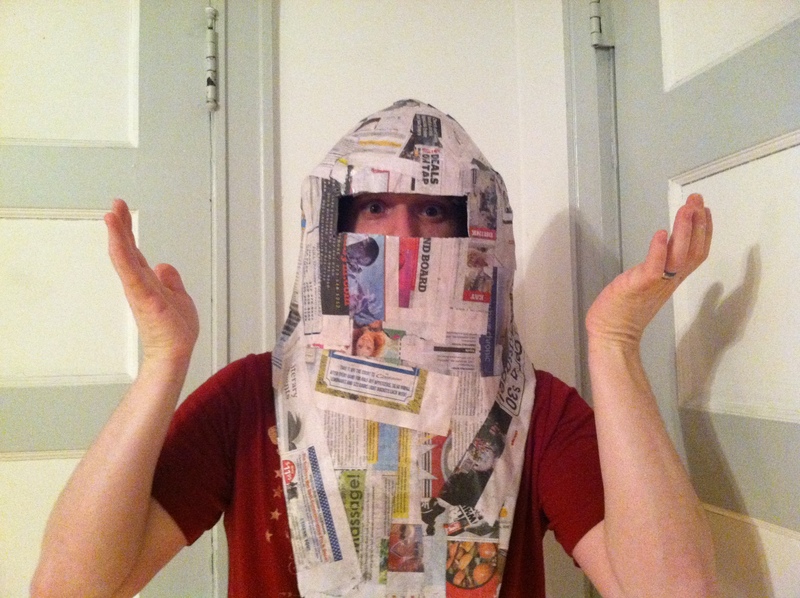 Have you ever had what felt like a crushing defeat when working on a cosplay of your own? Why not share your phoenix story with us in the comments section below? Now that we had a skeleton, a darn good looking skeleton, we needed to fill it in. Daniel’s first idea was to use chicken wire around the cardboard frame in order to get the shape and stability. That idea didn’t last long. The thought of wrestling with pointy wires with a pair of pliers didn’t seem very appealing when we realized that neither of us knew when we’d had our last tetanus shots. With papier-mâché, the tools and ingredients were easy to come by, didn’t cost a lot and, when applied in enough layers, would give us all the shape and stability we would need. 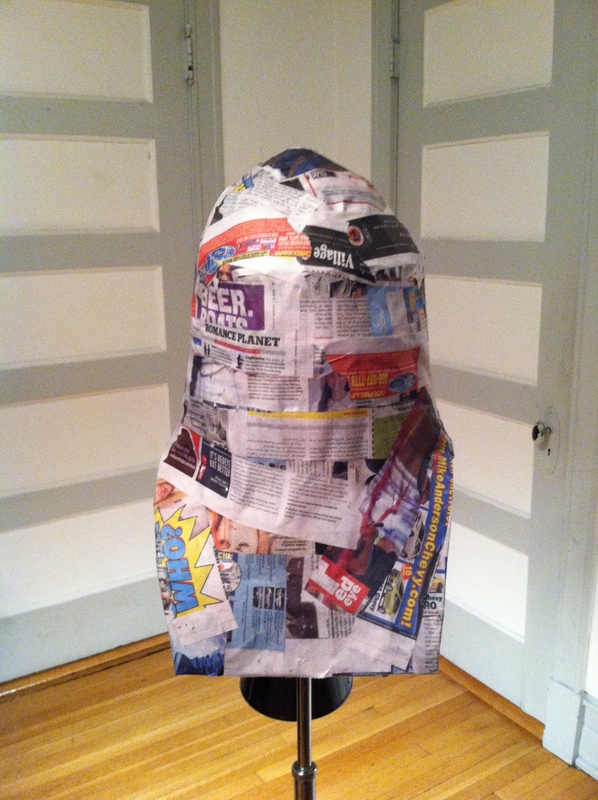 The skill level needed to work with papier-mâché is perfect for beginners and the feeling of peeling dried Elmer’s glue off the fingers is just plain awesome. Don’t pretend that you didn’t “accidentally” get glue on your fingers when you were a kid just so you could try to peel it off in one long piece. We mixed 8 oz. 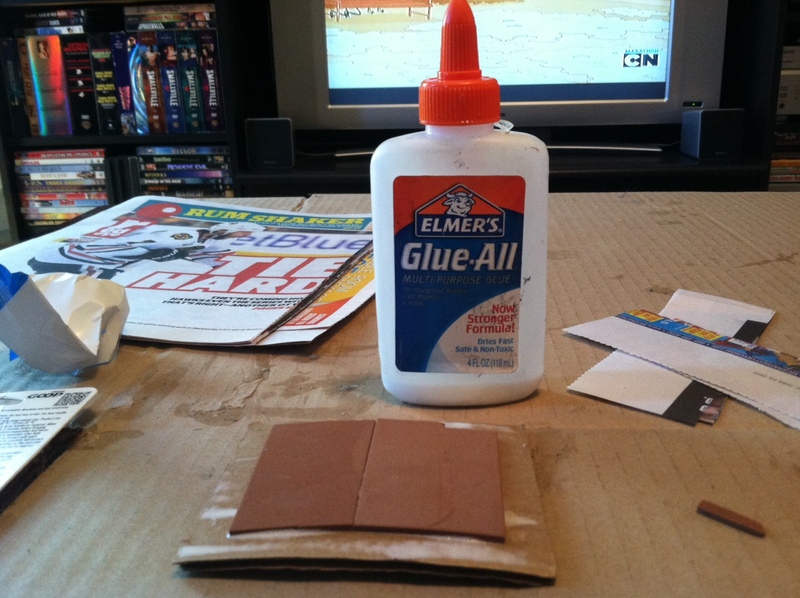 of Elmer’s Glue-All with 4 oz. of water in a plastic bowl. Depending on how sticky the glue you want to use is, you might need a touch more water. We were working with a 2 : 1 ratio. Don’t feel like you have to be super precise with your measurements here; two bottles of Elmer’s glue is 8 oz. so we just dumped them in the bowl and then filled one of the empty bottles with water. Don’t worry about being exact; it’s just glue. We cut several Red Eyes into strips. 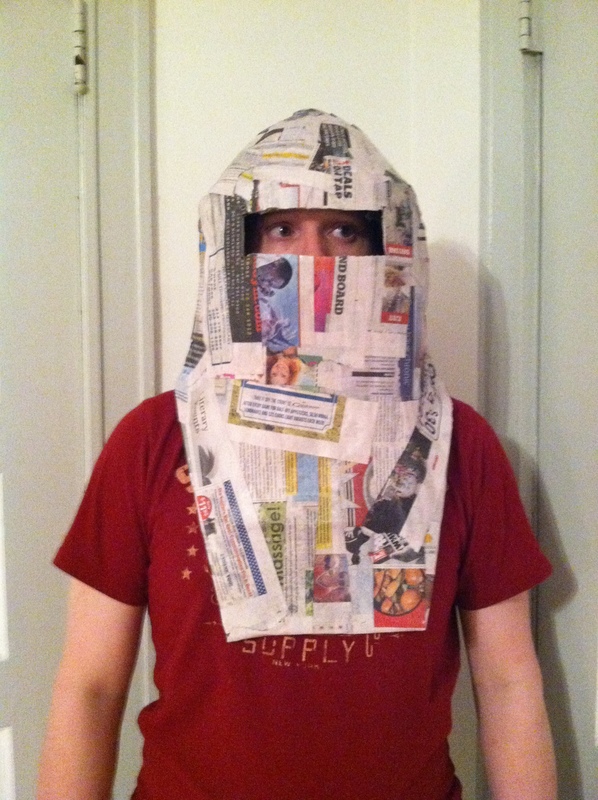 You can use plain-Jane newspapers if you want, but the Blackhawks were in the process of winning the Stanley Cup and our daily free newspaper, the Red Eye, was filled with stories of their victories so we thought it would be fitting to cover our helmet in their awesomeness. Go Hawks! 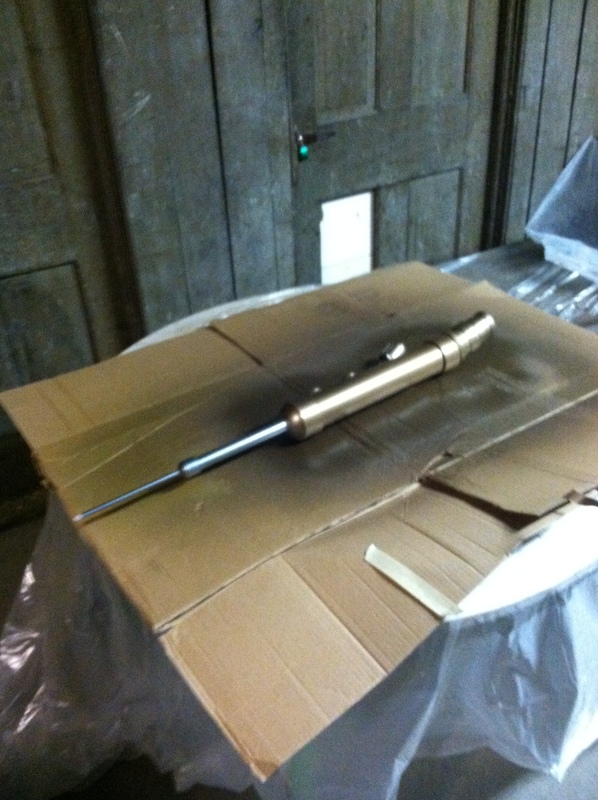 We then grabbed a couple of foam brushes and went to work. Daniel: The shape of Subject Delta’s helmet is so unique. We had to always keep the shape in mind and be conscious of where the cylindrical shape of the helmet would meet the arch of the shoulders. 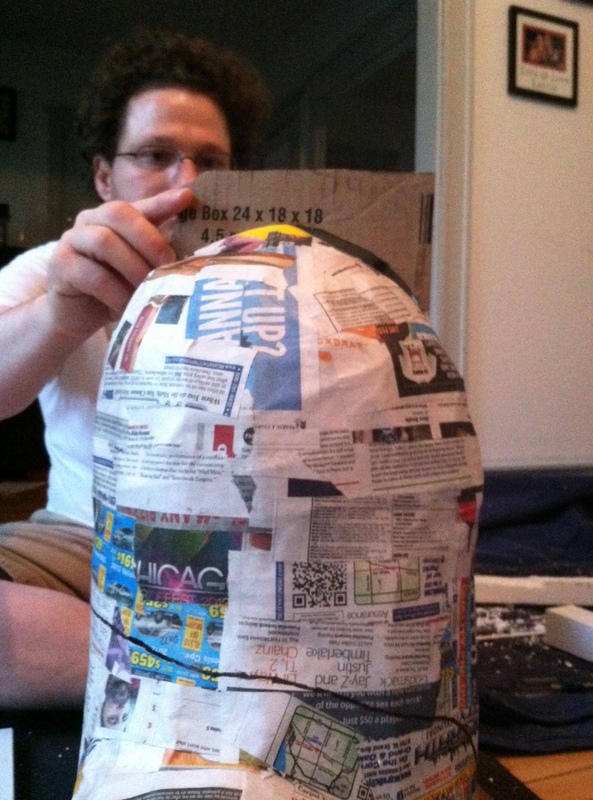 It was like trying to papier-mâché two different shapes together but make them look like one solid piece. We started at the base on the front and the back with thick, shorter horizontal strips and worked our way up. 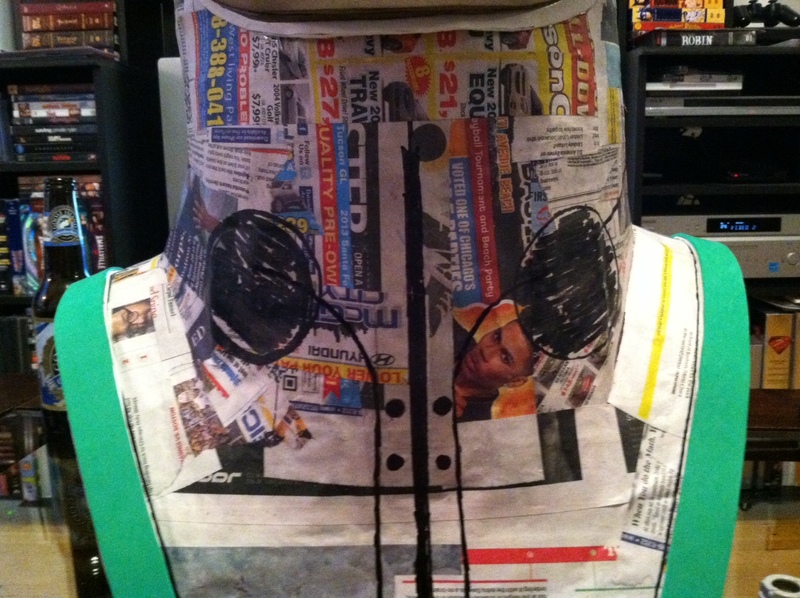 Then, when had to switch to longer, thinner vertical strips and work around the curve of the head. Working together, at the same time made the process move along very quickly but it made the need for communication even greater. We had to take many breaks where we would step back and map out our next path.Even though the cardboard skeleton gave us a fantastic foundation, we had to be careful to fill in the holes and maintain shape. Take, for instance, the back of the frame. There’s not a lot of spaces to help support wet newspaper strips between the middle support bar and those side bars that connected the helmet to the shoulder piece. We found ourselves really wishing that we’d added more support strips just for the purpose of stringing strips of papier-mâché together. We spent an hour and a half on this step of the process. With the frame filled in, it was beginning to look more and more like Subject Delta and we were getting more and more excited until we were finished. Daniel got really quiet and then went to the kitchen. He came back with a skewer, which was the only thing we had on hand that was long enough to saw through the layers of cardboard and papier-mâché, and cut out a rough eye hole. Here’s what it looked like. How disappointing. But we thought, maybe it will look better if Daniel puts it on..
Well. Back to the drawing board. At least we have nine whole months to get it right. Sara: I think it was because we only worked an hour and a half on this step but I wasn’t too upset at all. It definitely sucked but at least we could see where we needed to make changes. It should be no problem at all to whip up another frame and get it mached and ready to go! Daniel: As I was cutting the finished frame away from the helmet, I tried not to think too much about it or I would get angry. I knew that it wouldn’t work, that we could do better so I had to get it over with. I knew that the longer I stared at how poorly it came together, the angrier I would be. Sara: I had no idea you were so upset. Daniel: I was very upset. How do you deal when you’ve been working on a process which requires multiple steps only to find out after all your hard work that you need to start over? Why not share in our comments section below? 7 and 1/2 hours in, and we were having to start again from scratch. 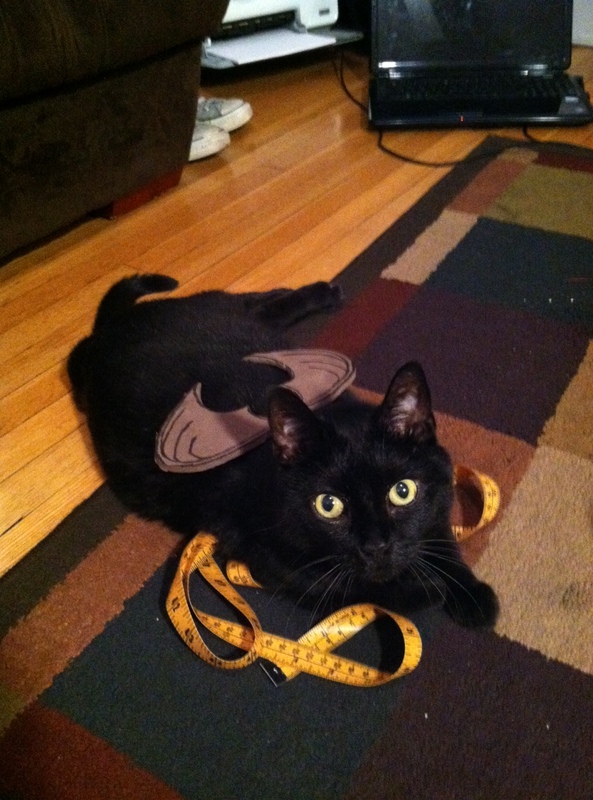 Regardless of how upset he was, he posed for this picture, which we will leave you with until next week. Oh well. Maybe next time!